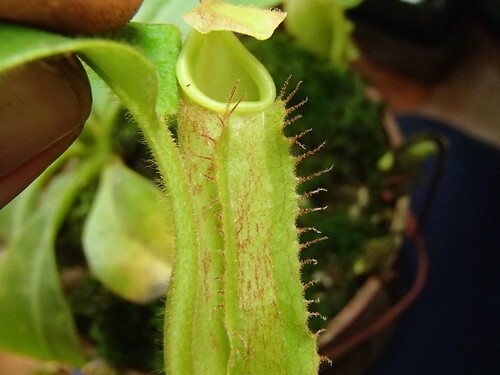 crebre transverse sulcatum costatum v. carinatum, rarissime Iseve. 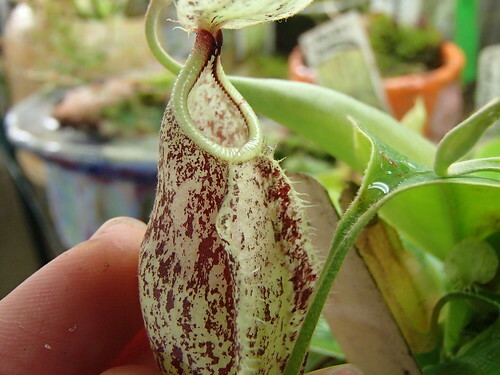 * Folia petiolata, petiolo anguste alato. 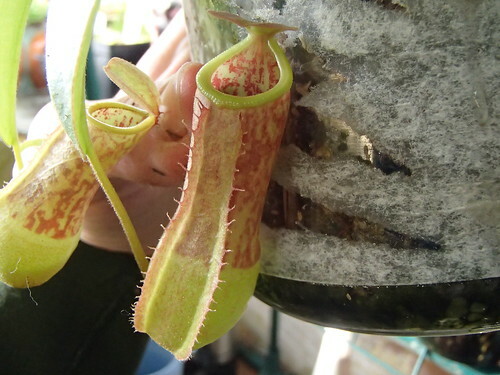 a. Peristomium dilatatum, margine interiore pectinato. 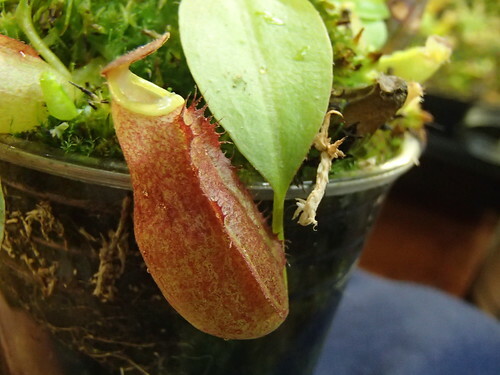 Last Edit: Oct 31, 2014 6:11:57 GMT by Not a Number: "de" repeated in typing de Candolle's name. 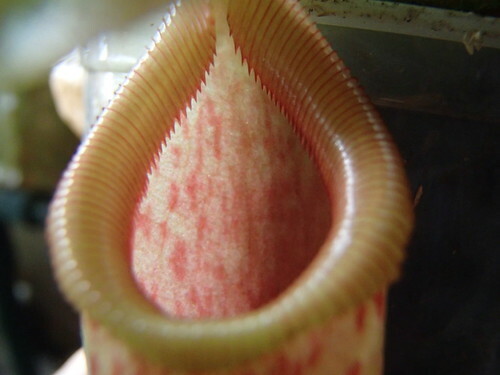 And if you do not agree with Adam and Wilcock, you're good using the original name. 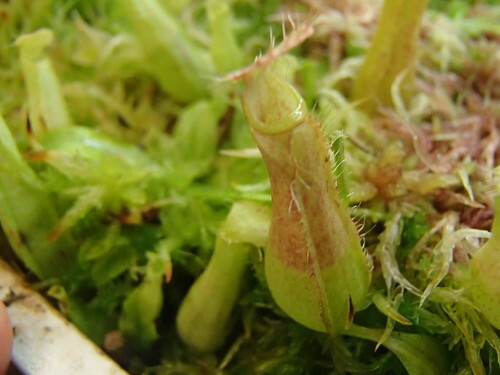 It does not have to be "resurrected", it is already published. 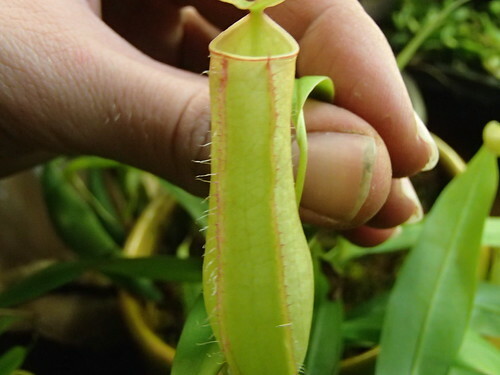 What is important, is if you're going to publish a rebuttal to Adam and Wilcock, you would have to do a lot of work following up on everything they looked at and their conclusions or your theory will have less support regarding an "official" change in rank. 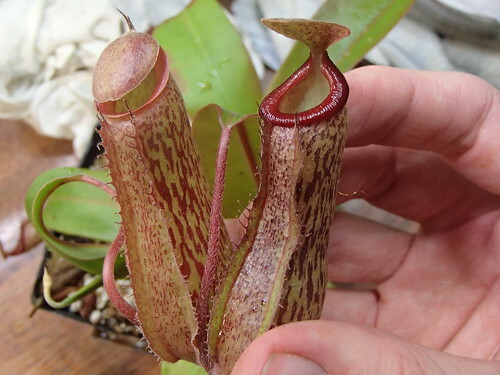 N. rafflesiana "dark brown parent." 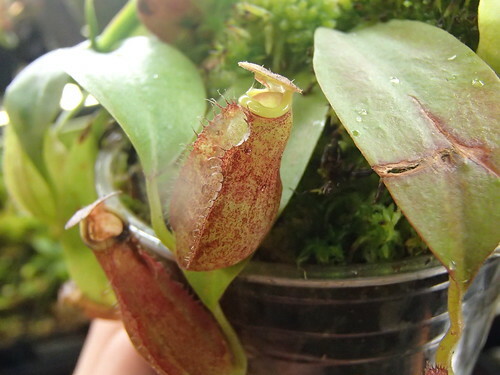 Each new pitcher is better, and the color on the older ones getting deeper. 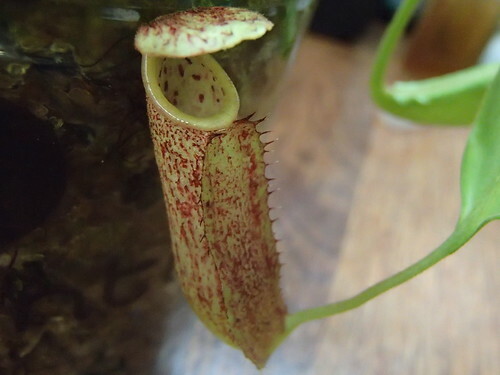 The darkest of the 'Splendid Diana' x ventricosa "red"
The two biggest of the N. mirabilis "Sajingan"
N. 'Splendid Diana' x ventricosa "red"
N. rafflesiana "dark brown parent"
I've made many crosses with my red ventricosa, and this is one of the species batches, "cherry lips" x "red"
I am relabeling this amp seedling as "red speckle"
Ando one from a "vine"
I really wish my camera would capture the true intensity of the reds. 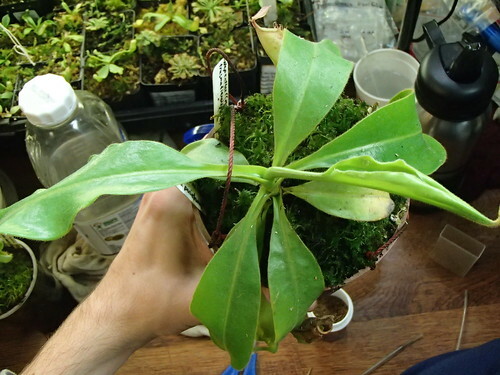 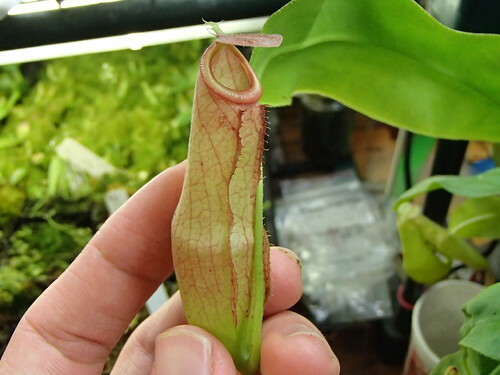 'Mark Lang' is very deep red, and the peristome a perfect deep cherry. 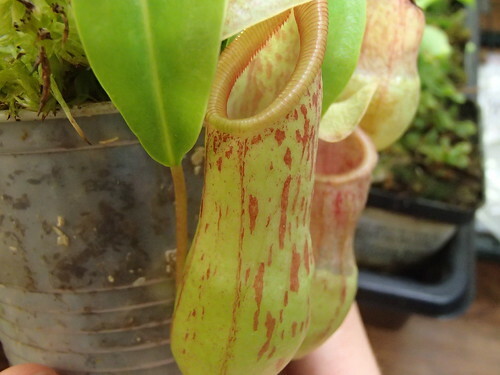 Up close to the lights, a really dark ampullaria "Harlequin"
The seriously colored 'Splendid Diana' x ventricosa "red"
Without a doubt, the fattest of the bunch. 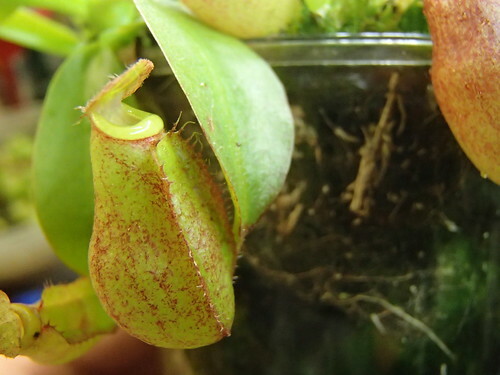 New arrival, platychila x rc. 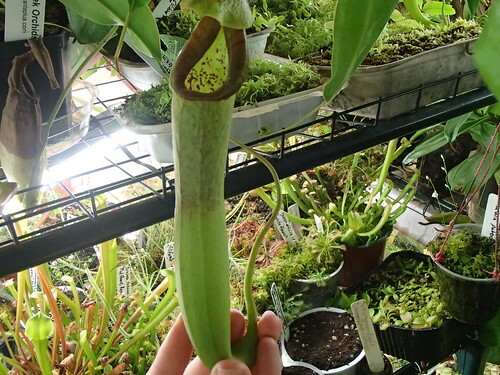 I know a lot of people don't like the rc hybrids, but even without real color I think they're attractive, and I can't wait to see how this cross becomes. 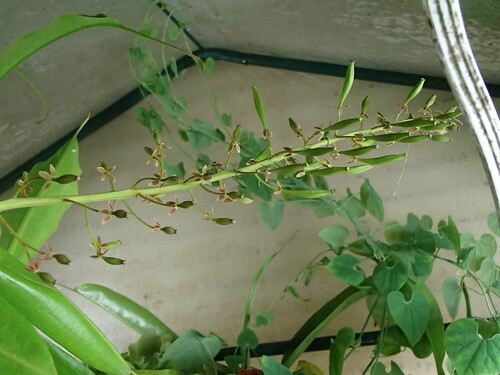 Lastly, a picture of my 'Rokko' Exotica flower stalk. 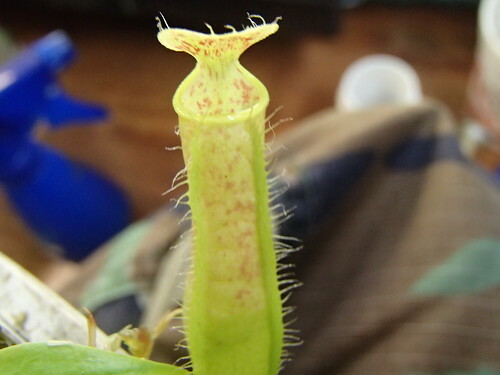 Only two attempted crosses really took off, x mixta and x (inermis x singalana) x mira. 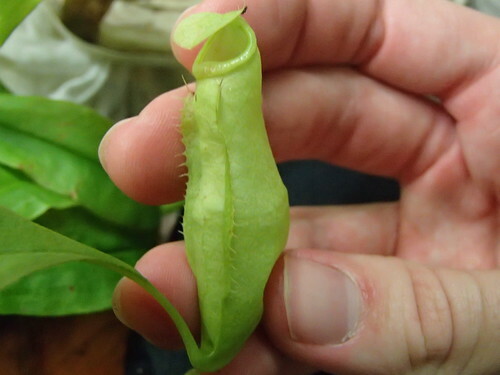 However, there are a handful of scattered pods in both the spectabilis x mira and maxima x campanulata sections that are notably larger than the rest and may yet yield some seeds. 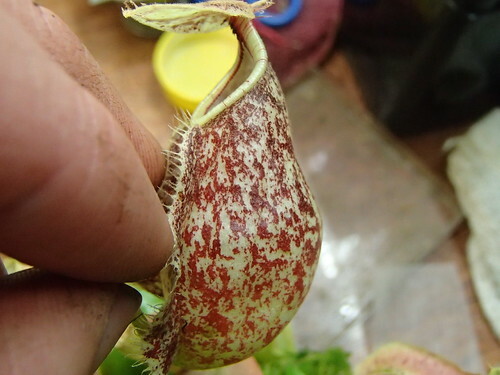 Please take note, all or most of your "rafflesiana" are in fact pure N. hemlsyana or hybrids between the two. 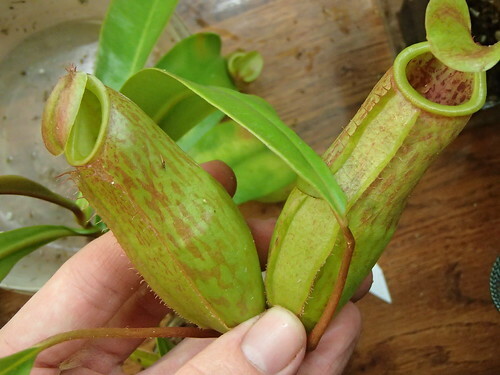 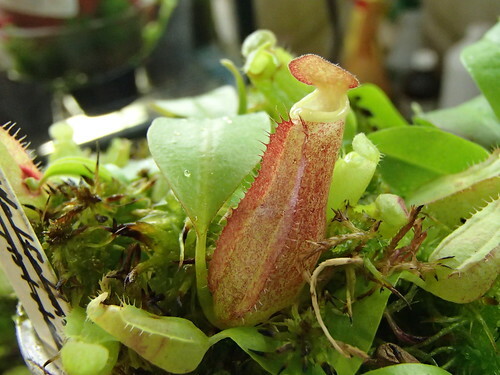 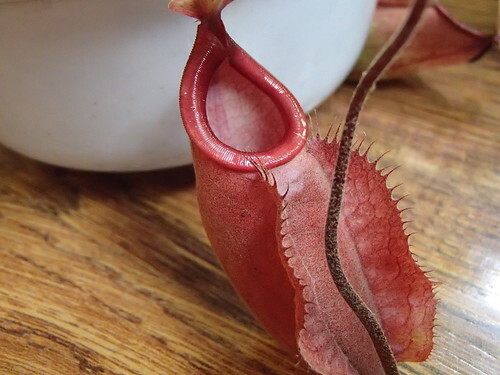 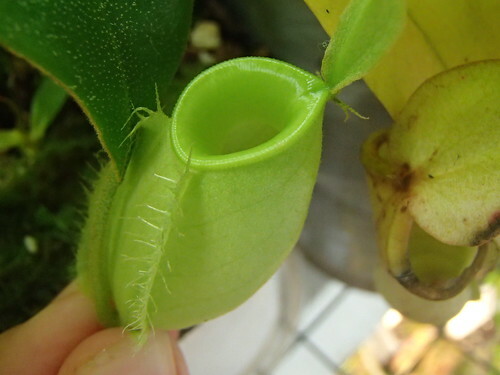 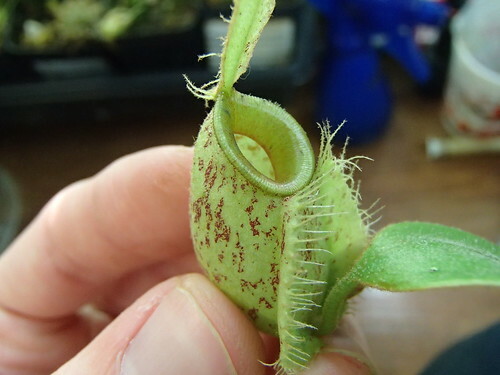 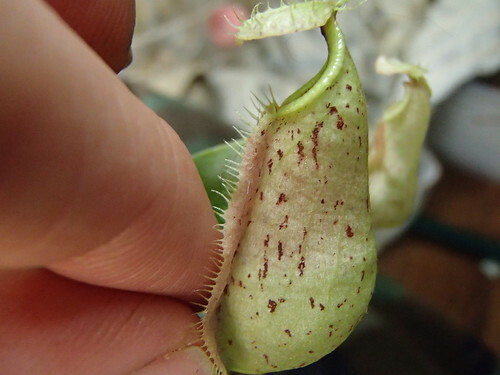 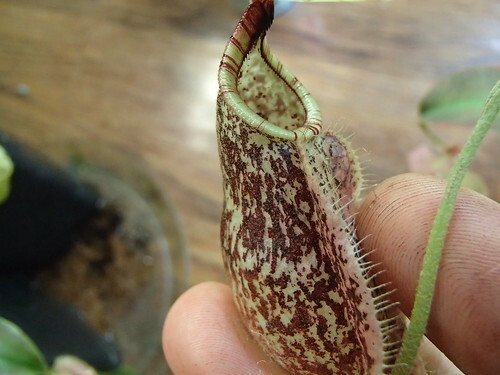 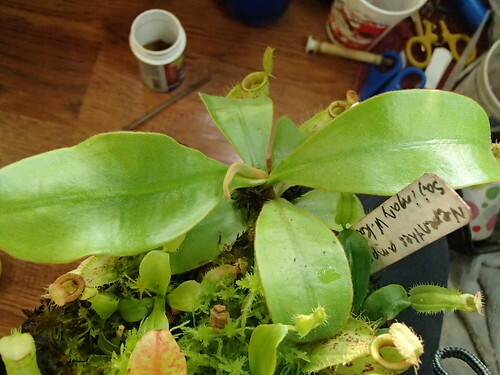 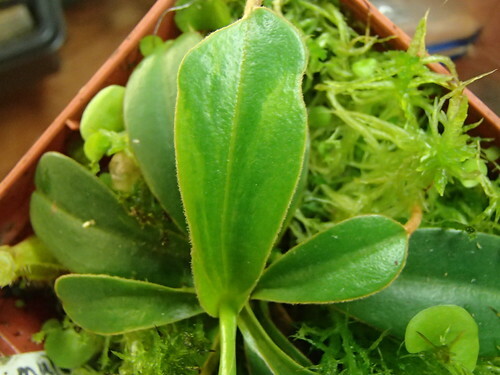 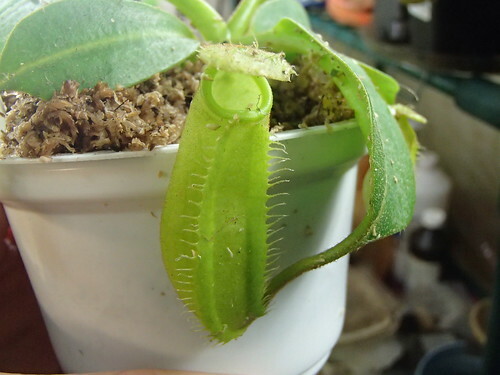 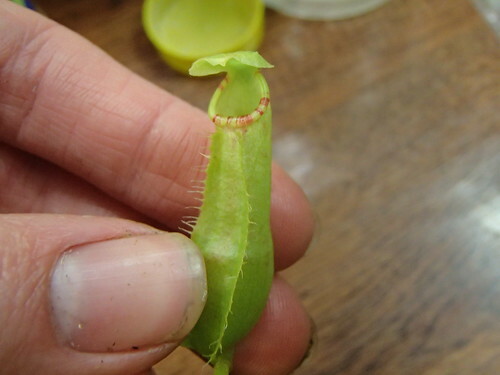 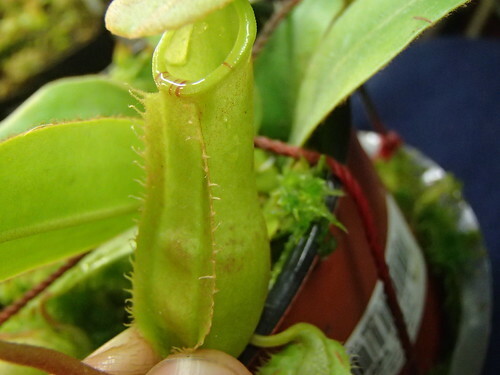 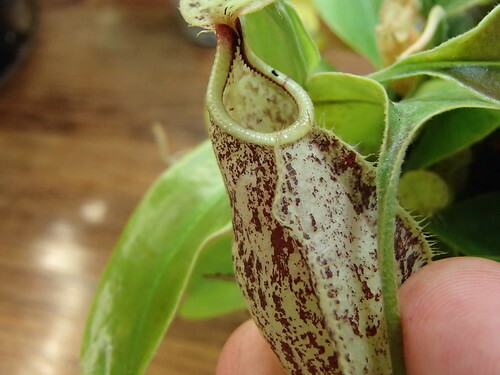 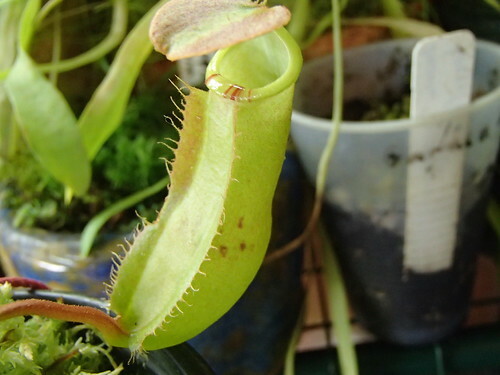 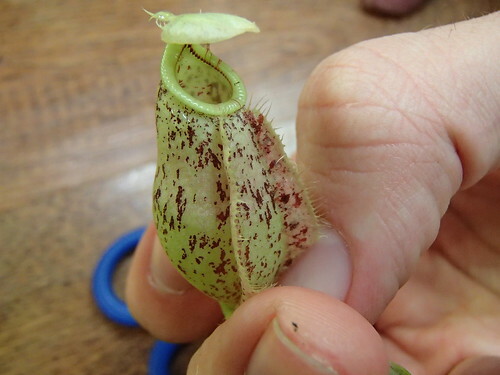 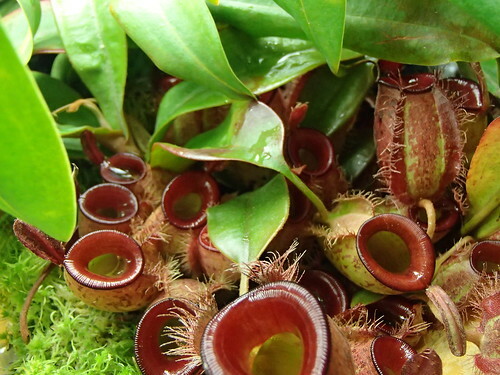 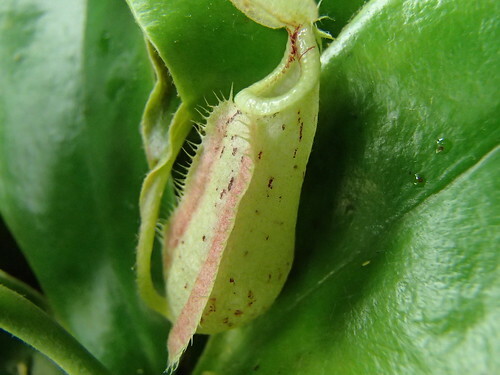 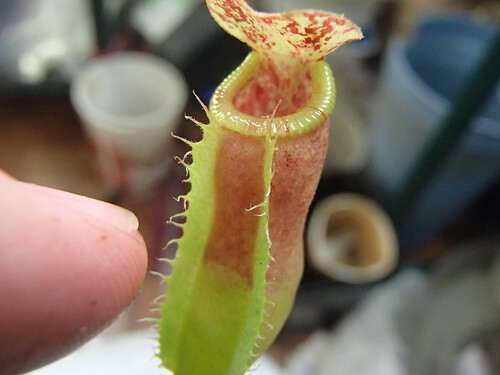 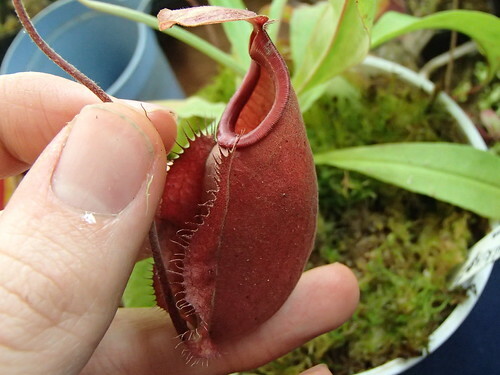 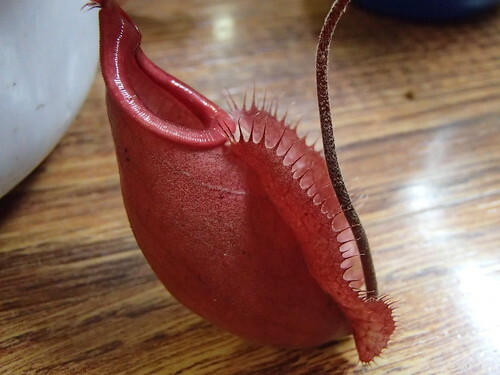 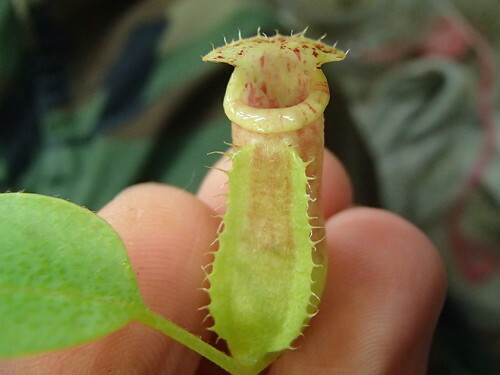 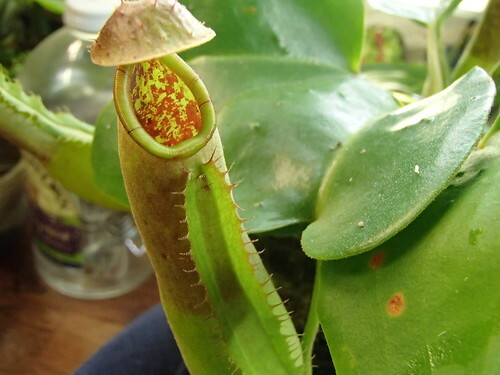 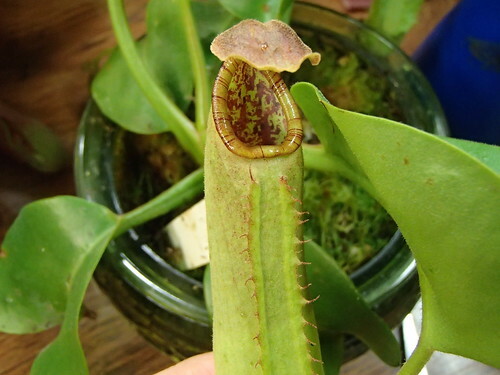 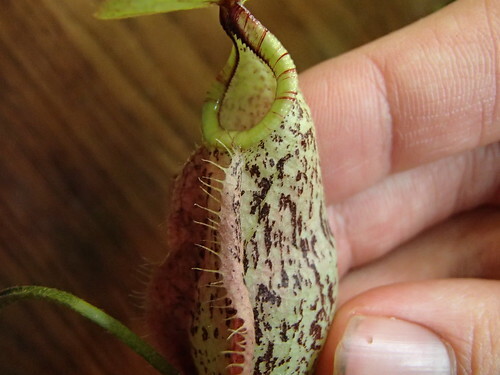 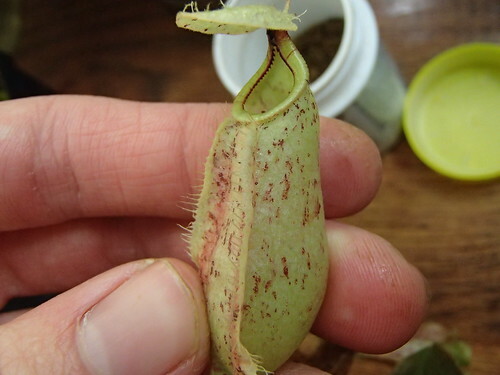 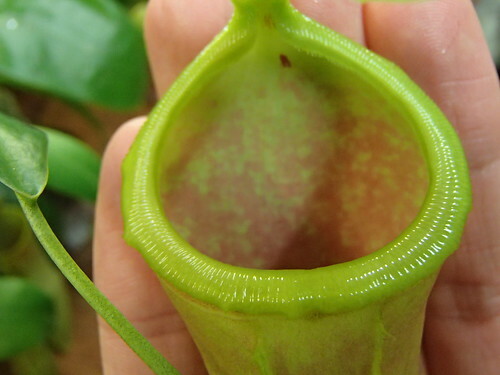 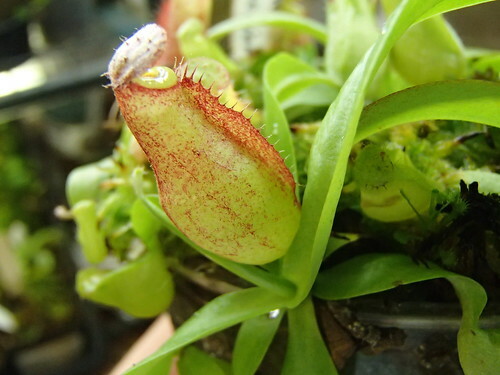 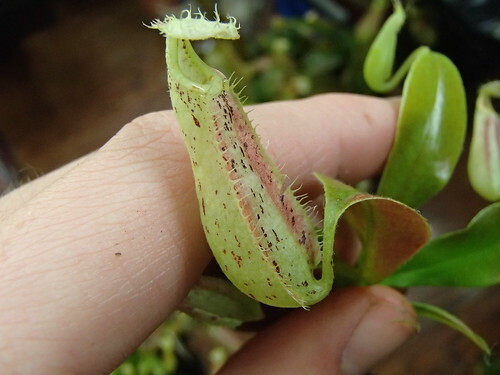 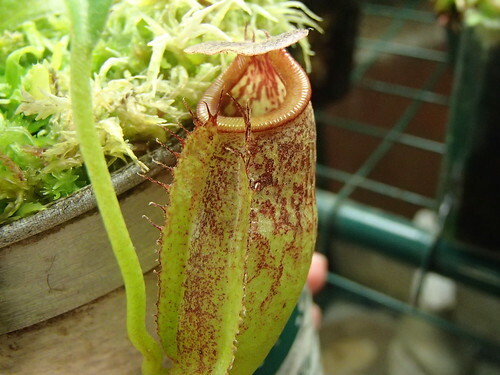 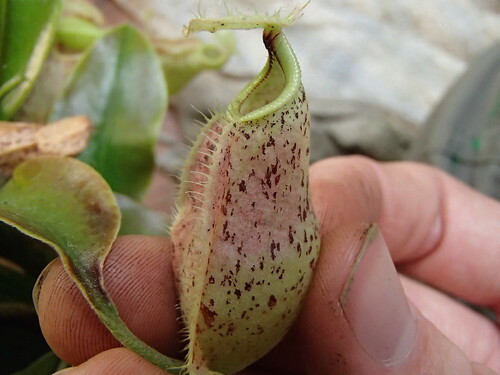 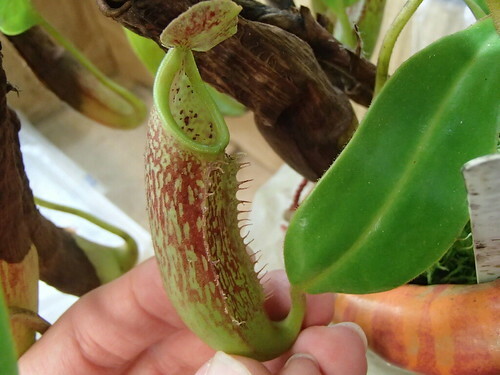 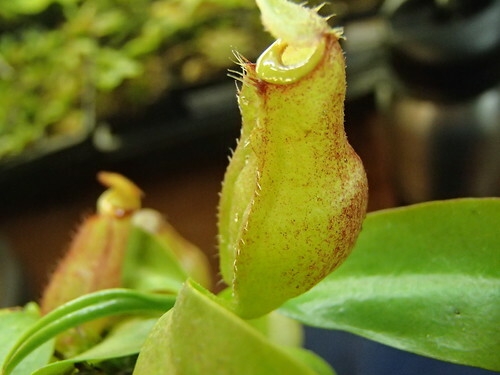 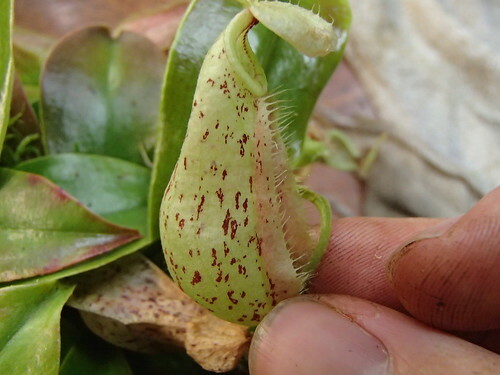 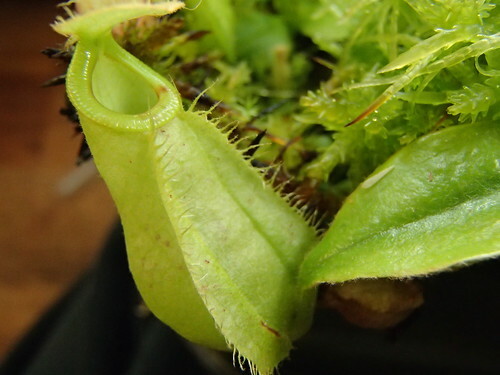 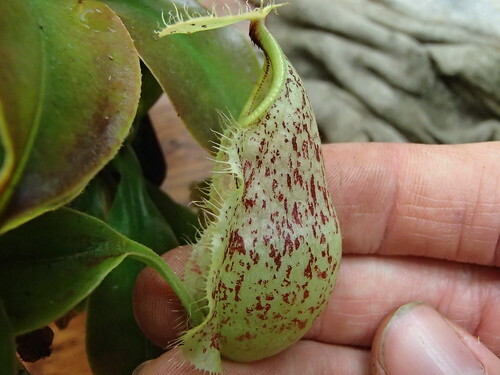 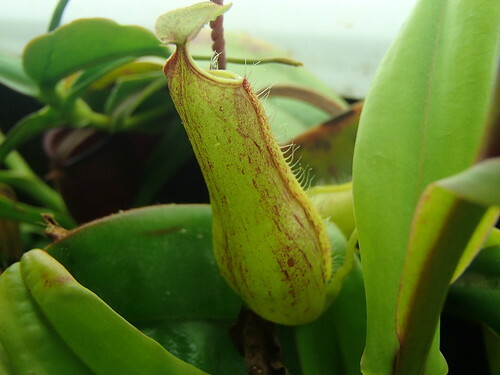 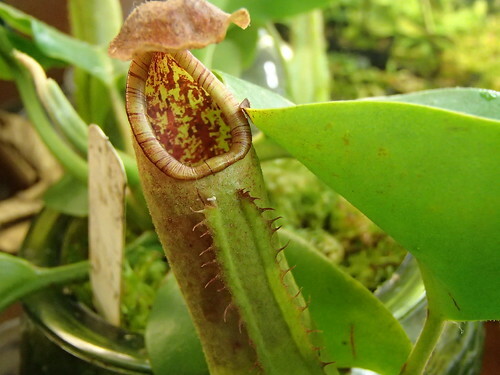 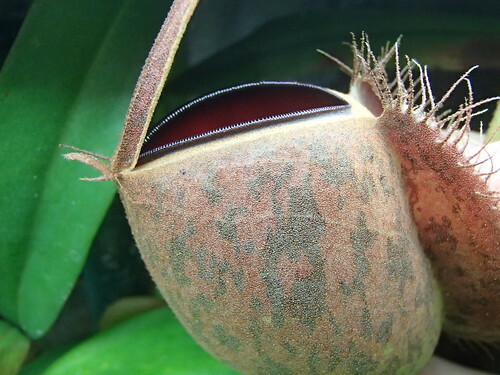 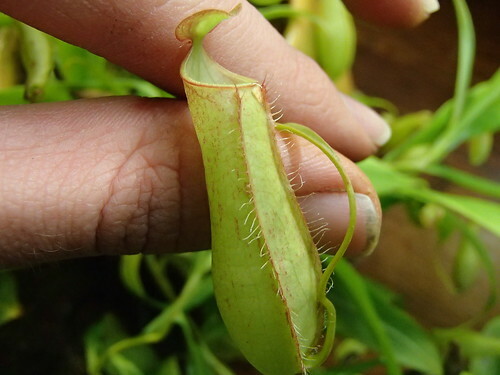 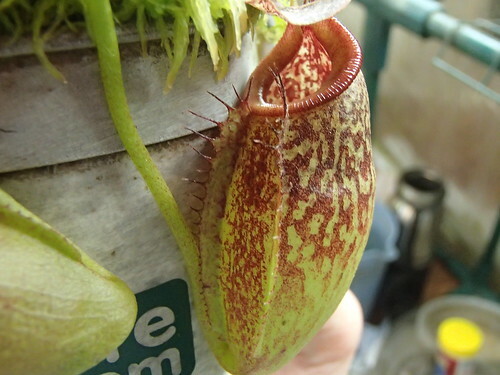 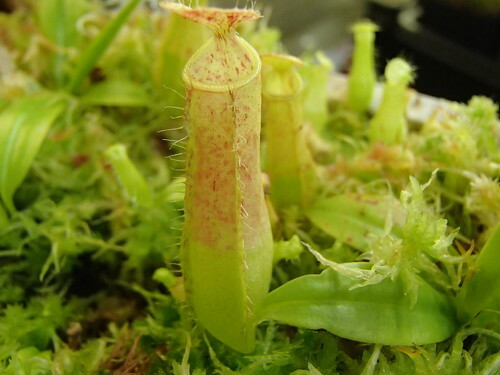 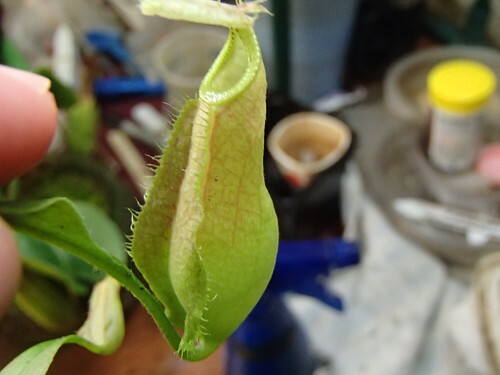 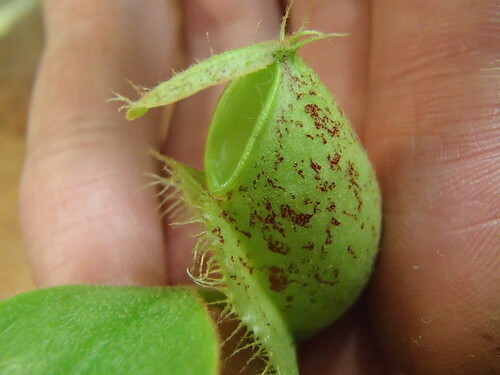 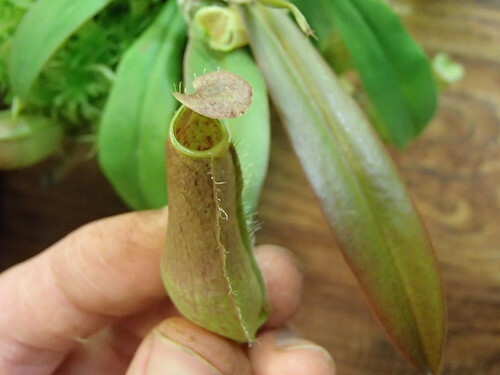 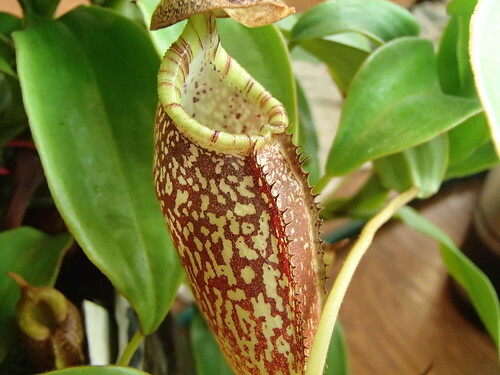 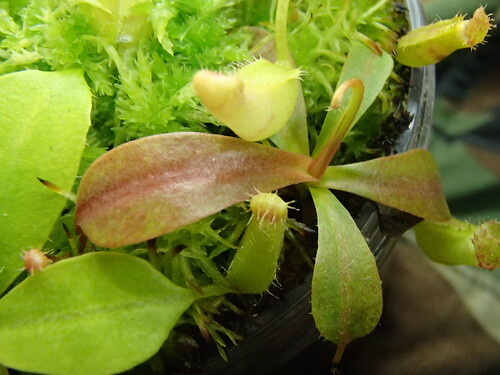 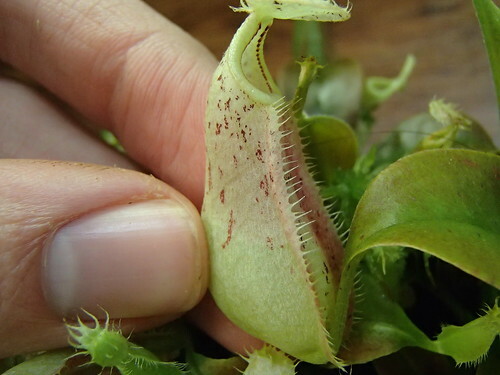 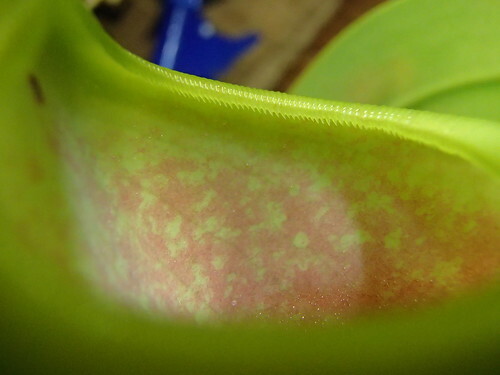 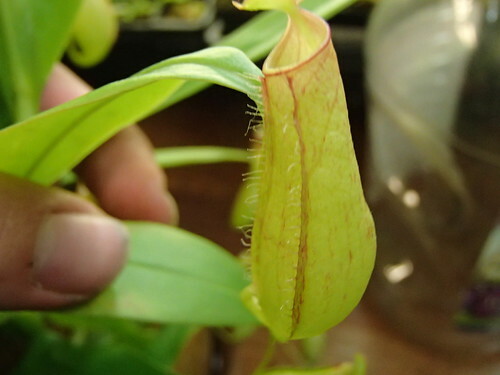 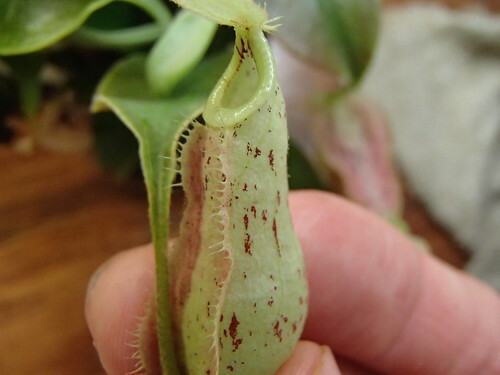 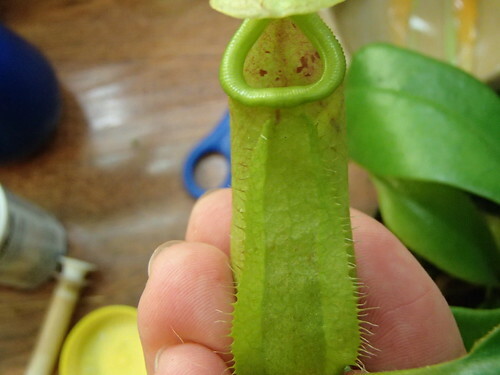 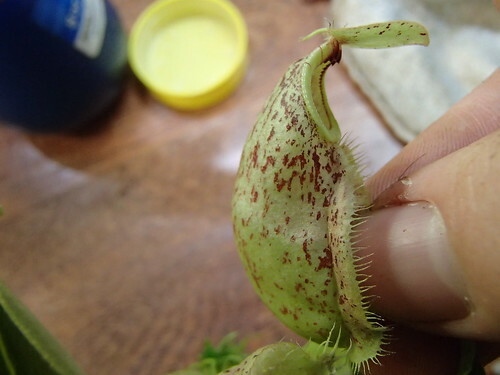 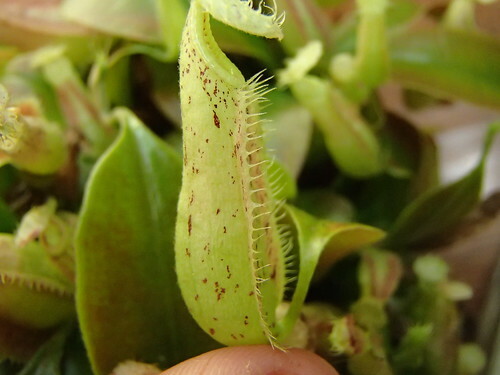 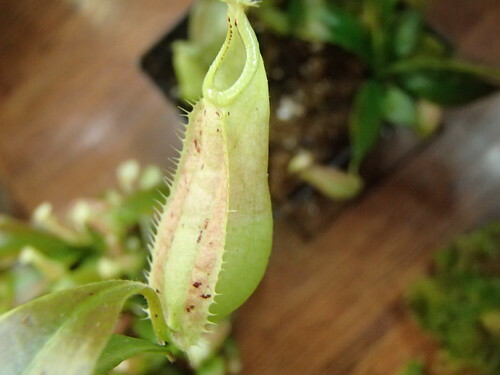 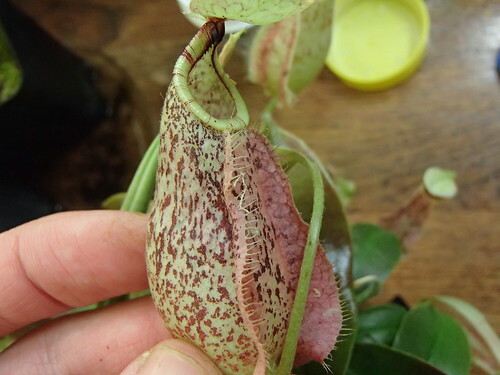 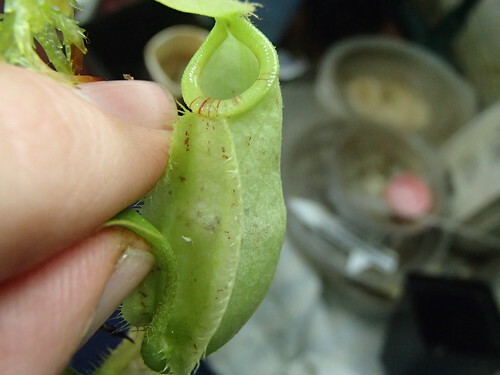 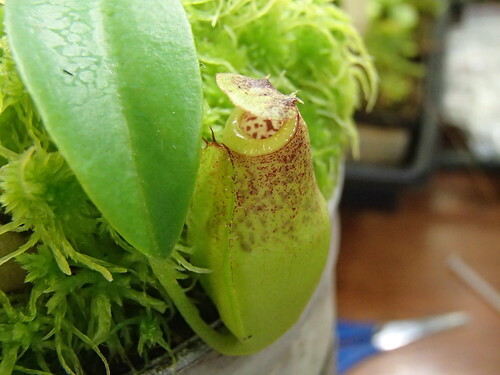 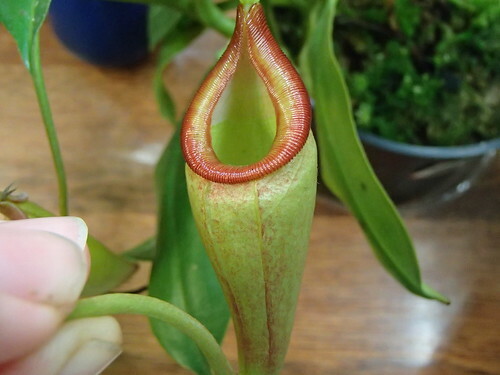 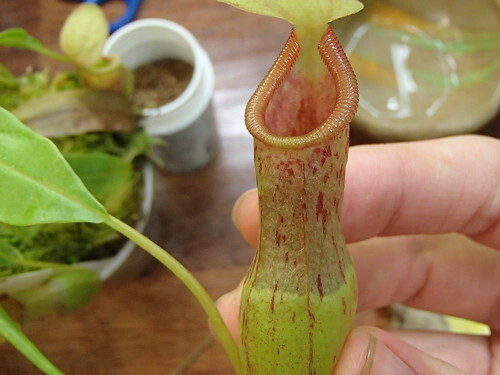 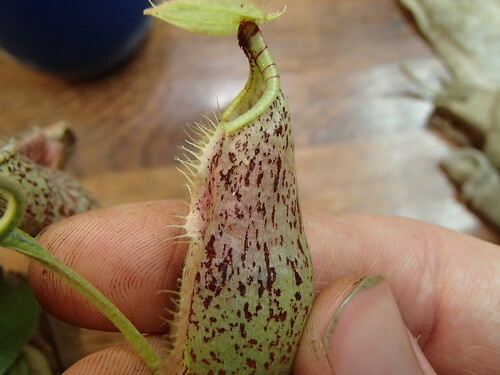 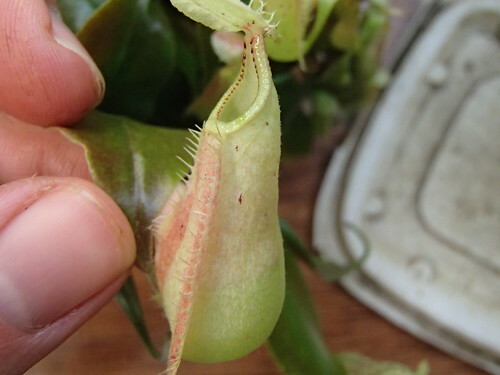 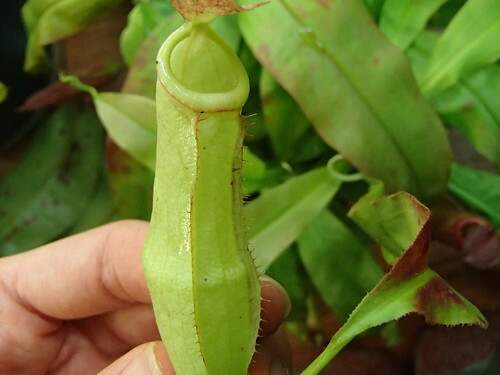 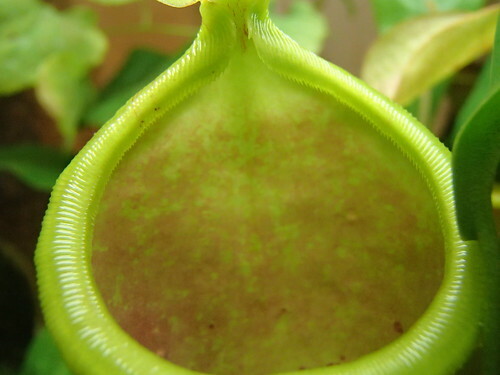 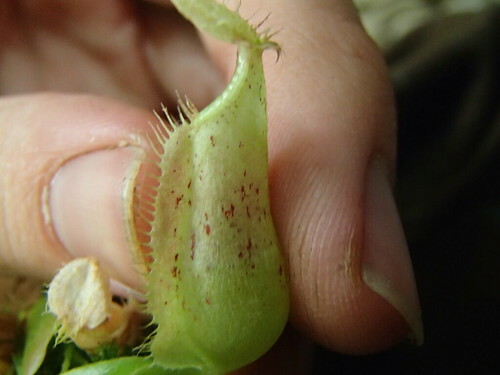 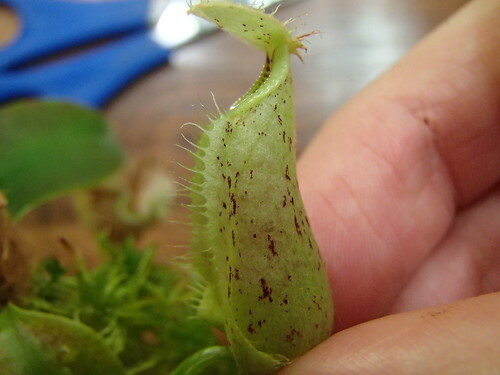 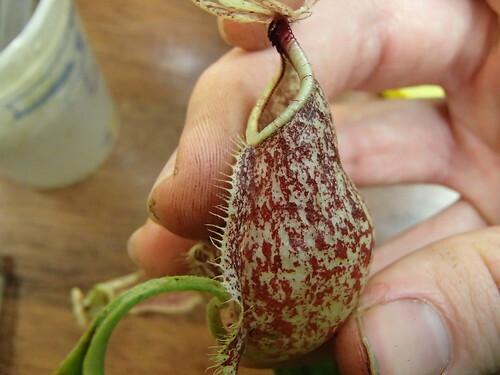 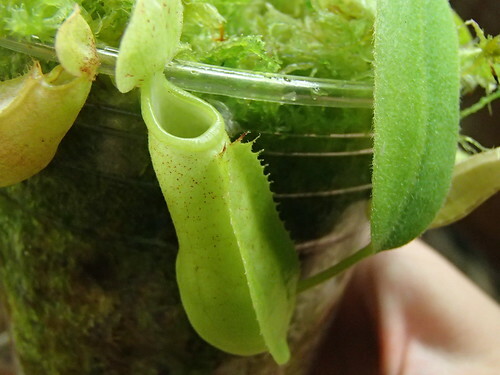 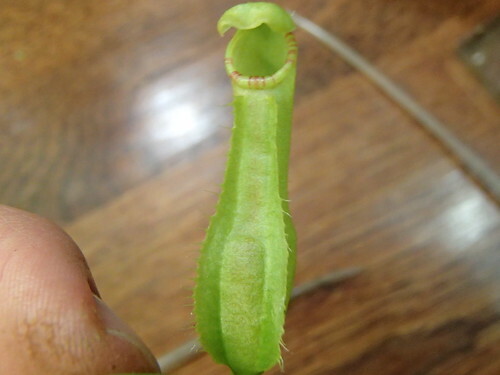 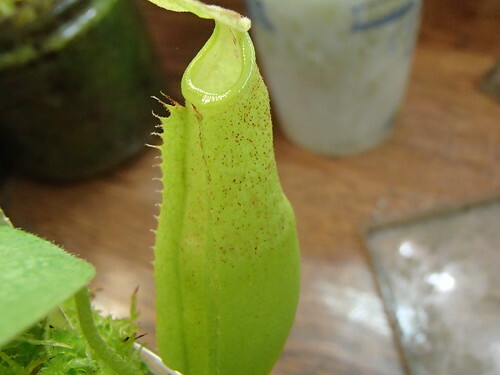 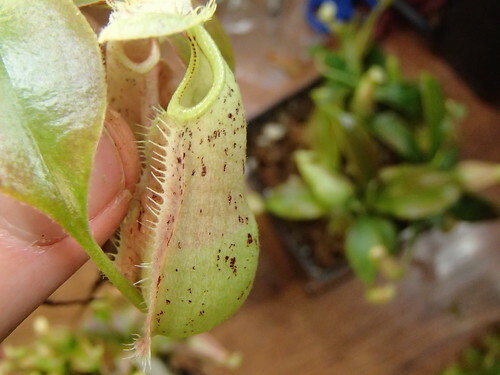 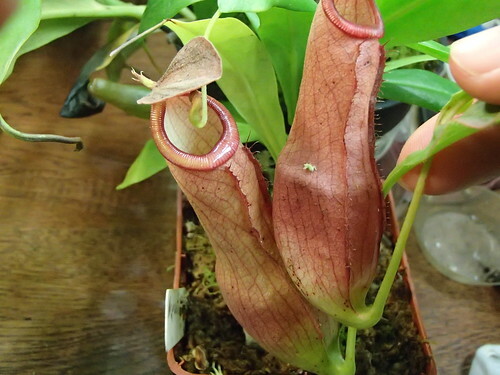 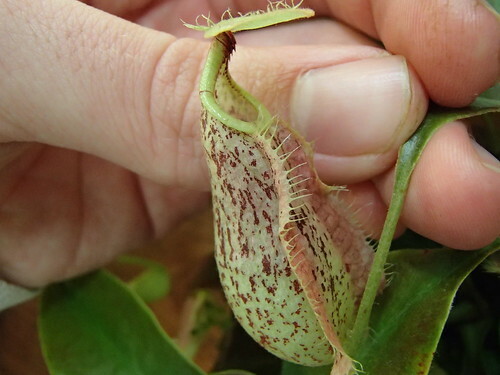 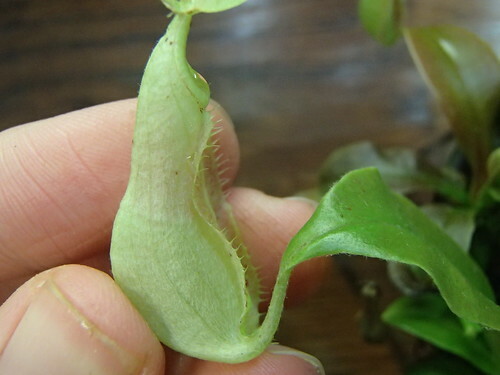 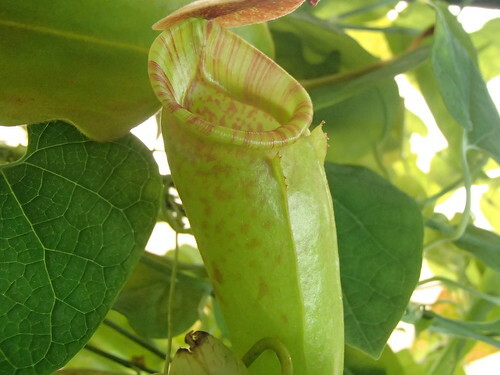 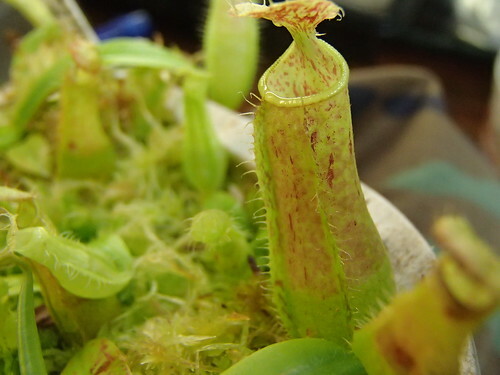 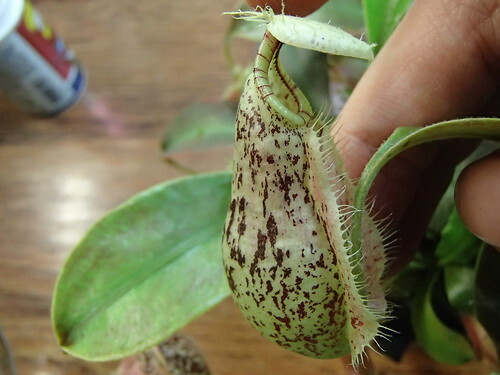 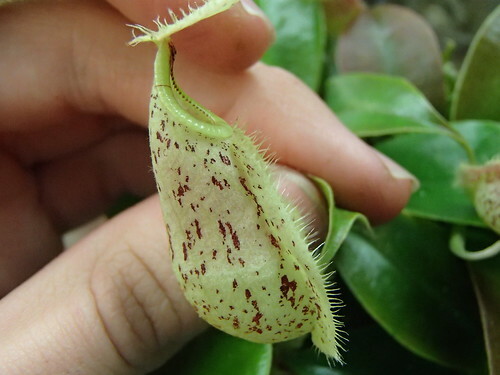 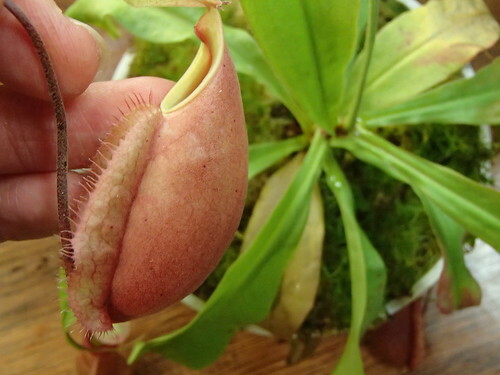 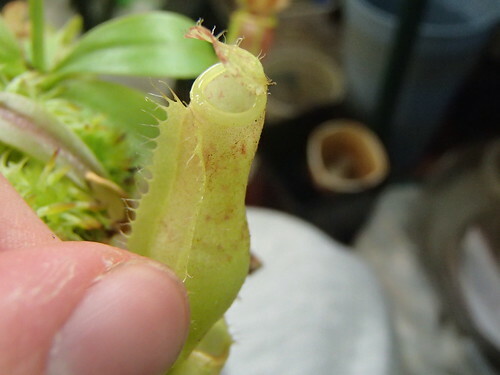 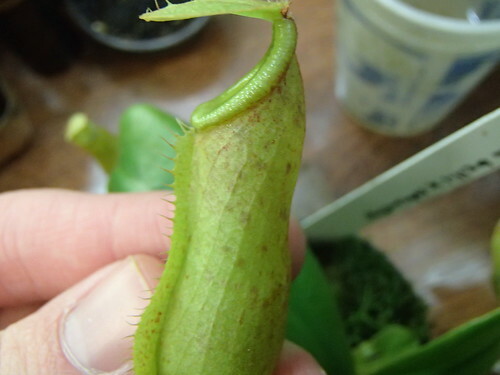 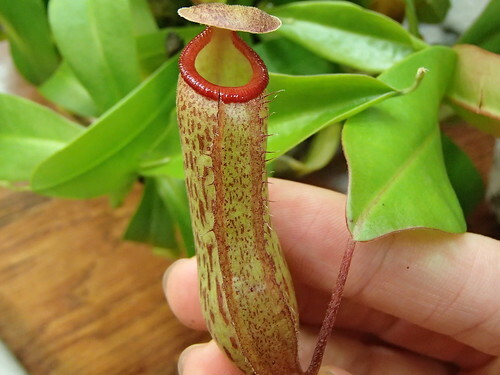 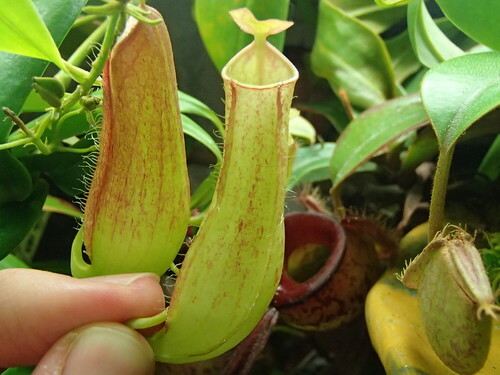 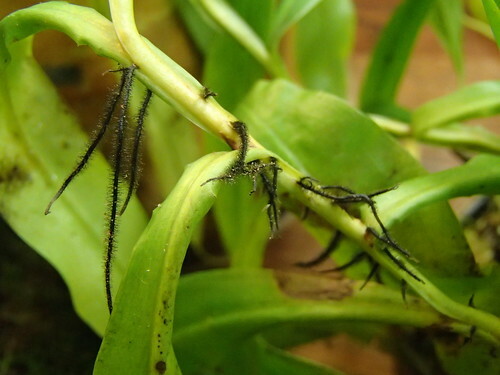 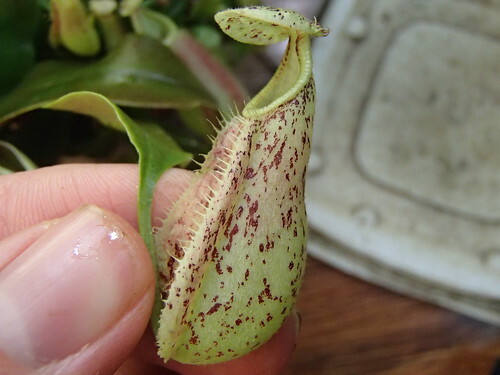 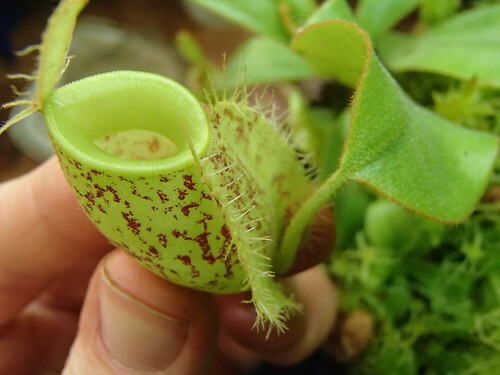 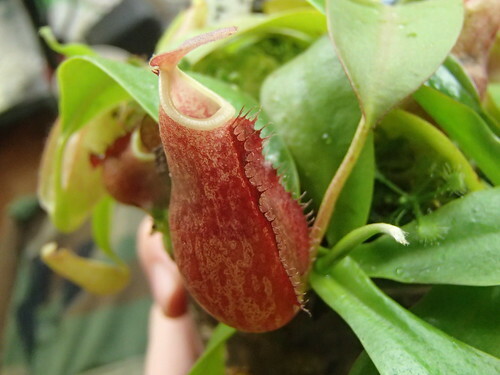 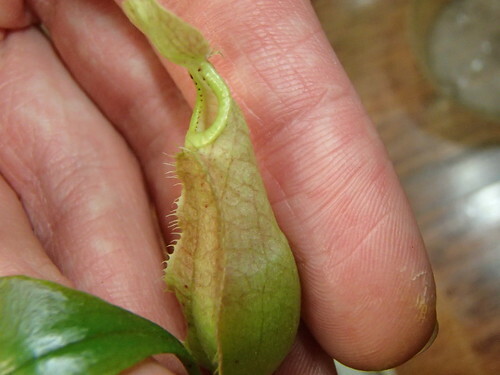 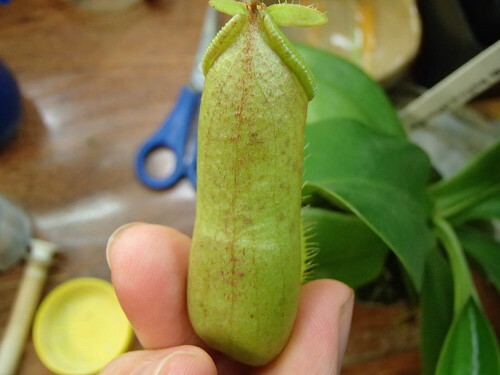 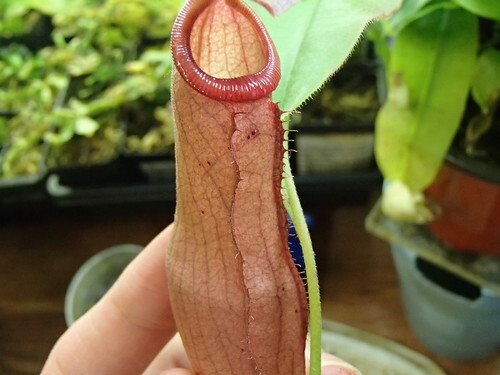 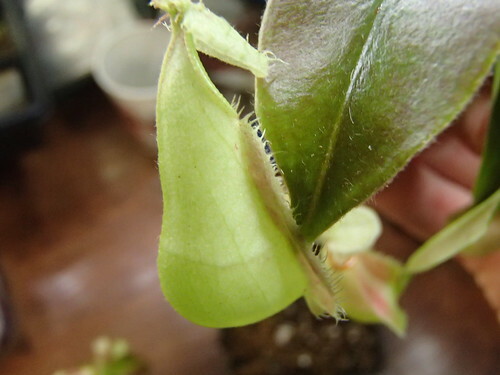 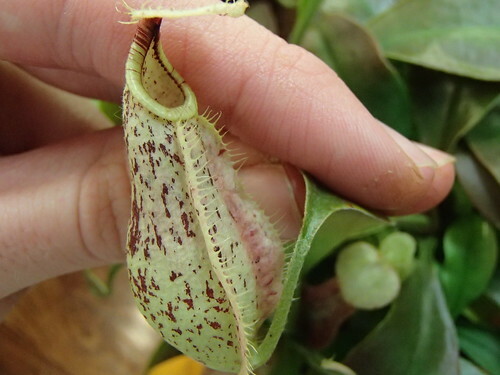 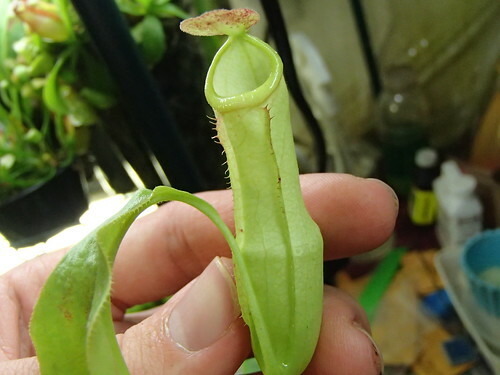 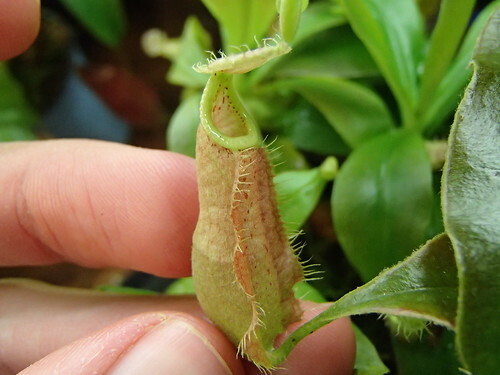 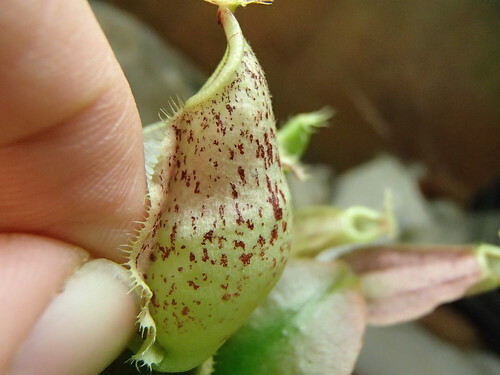 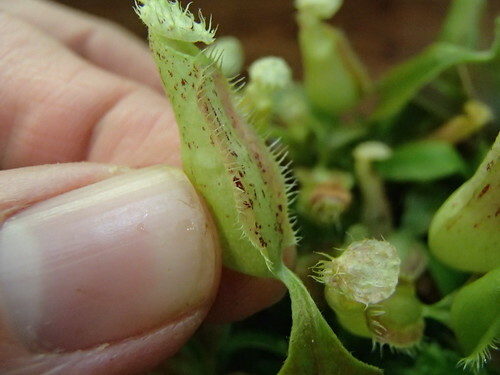 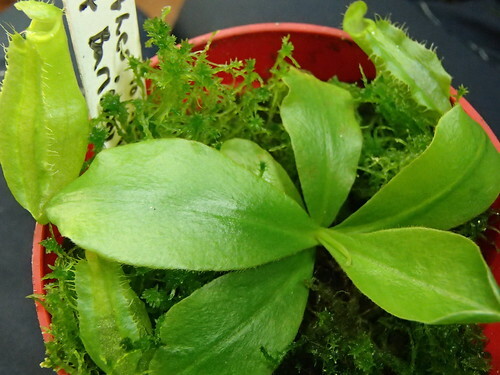 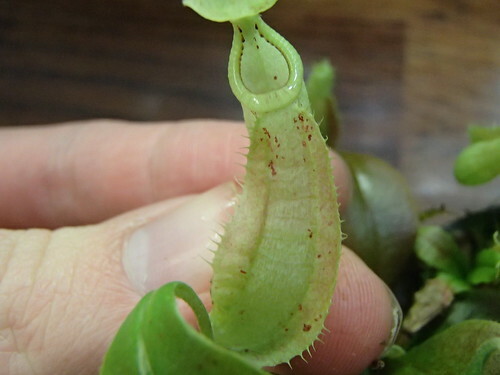 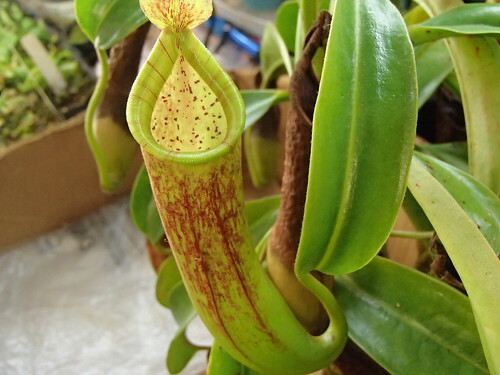 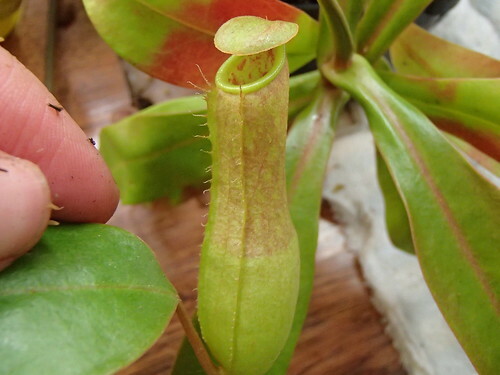 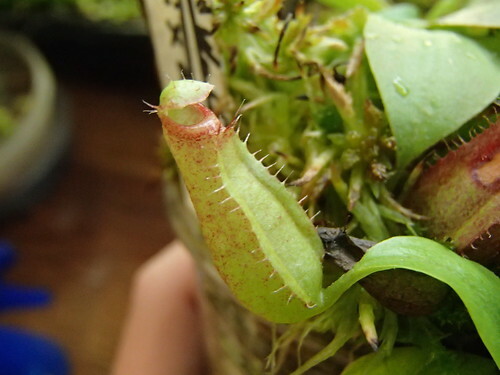 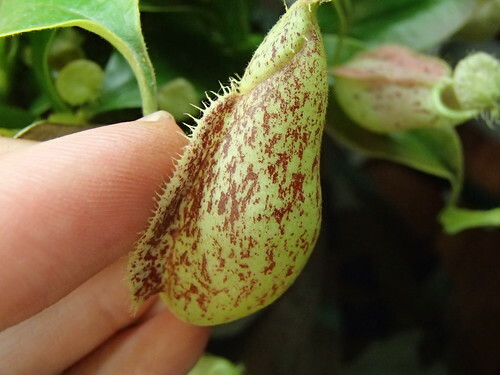 While all very small Nepenthes seedlings can show misplaced wing fridge elements on the lid, only N. hamata and N. tentaculata match the pattern seem on the lids of N. hemlsyana. 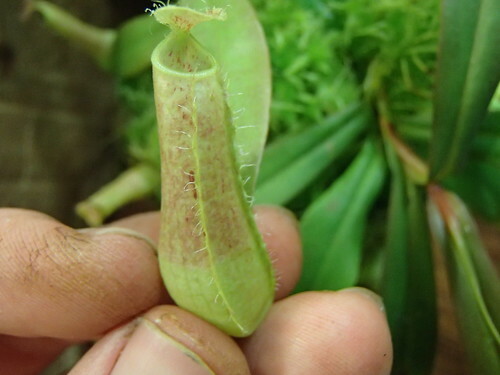 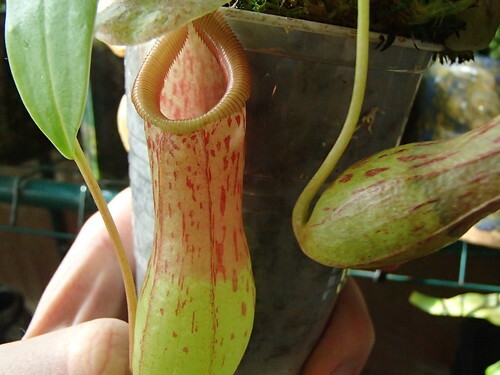 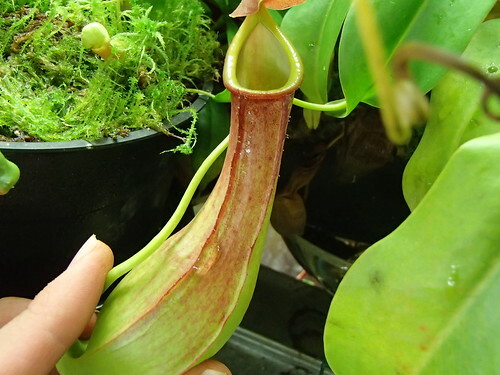 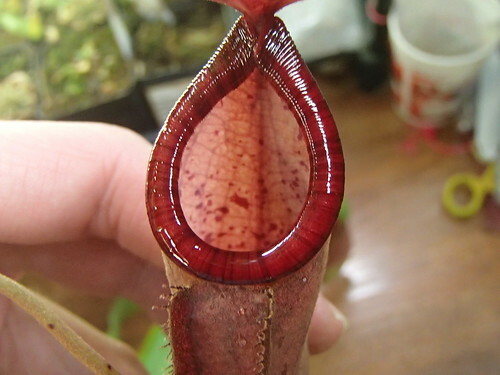 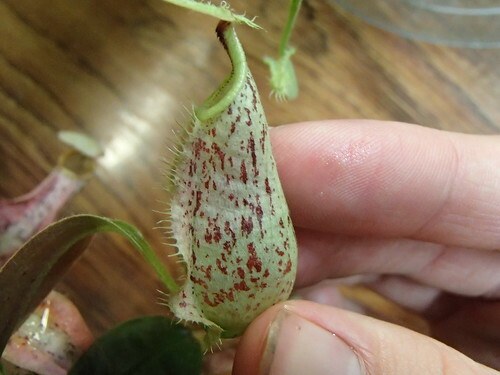 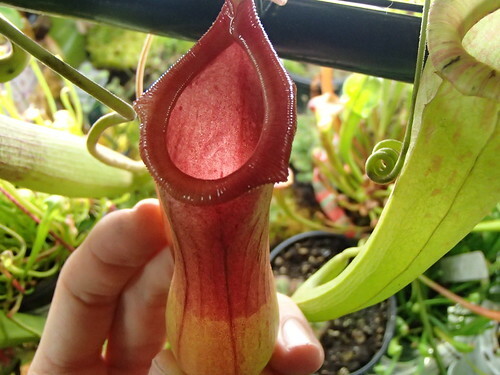 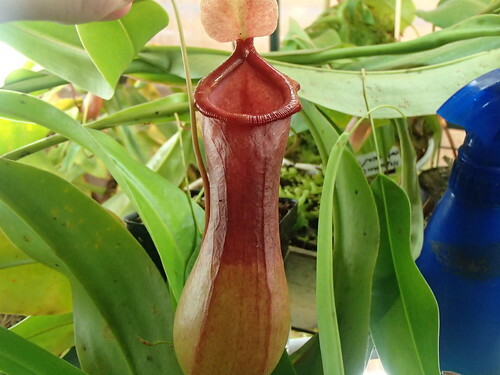 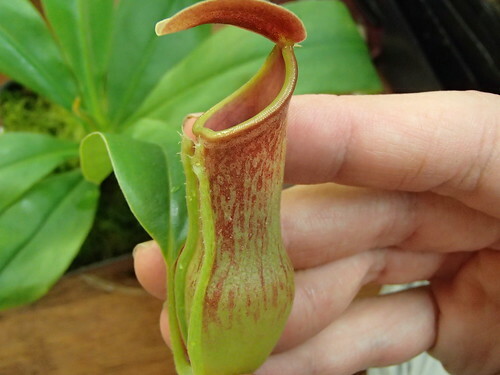 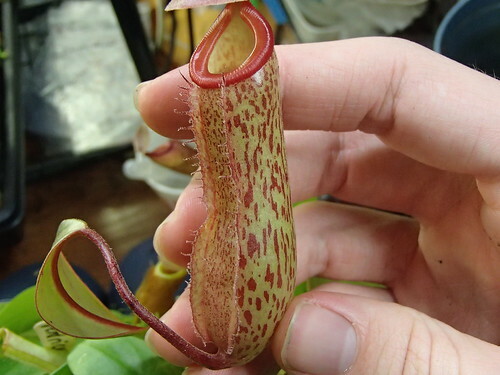 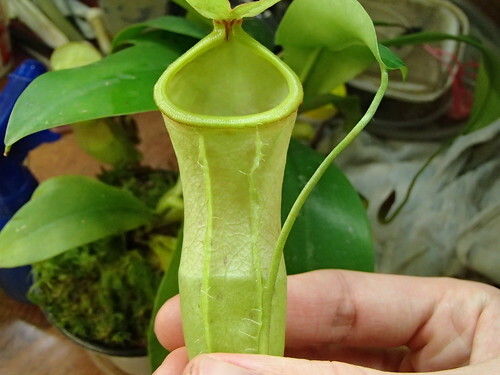 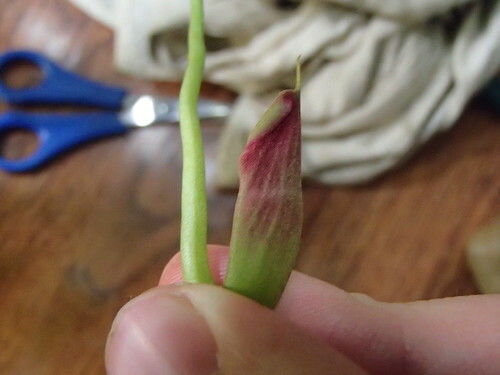 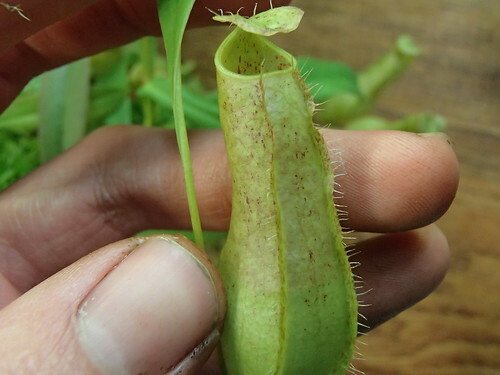 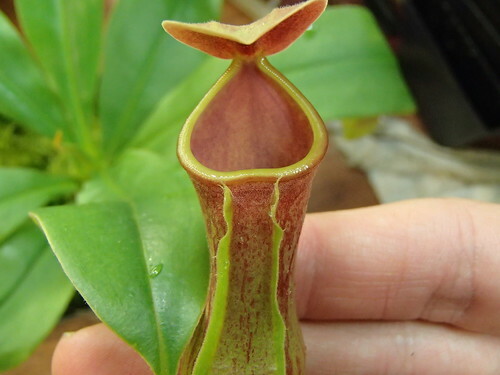 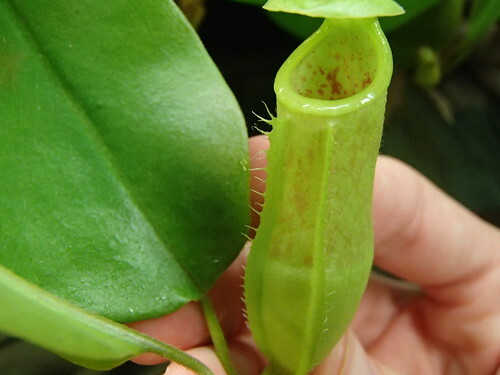 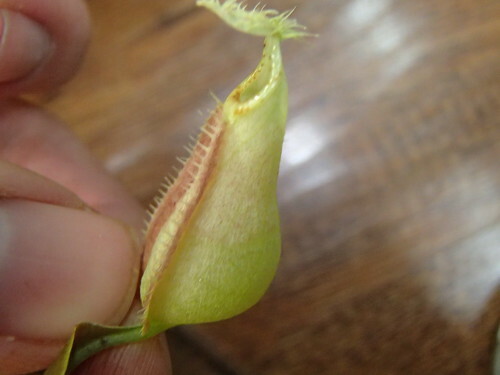 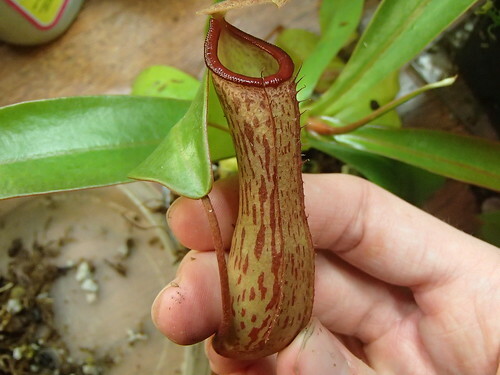 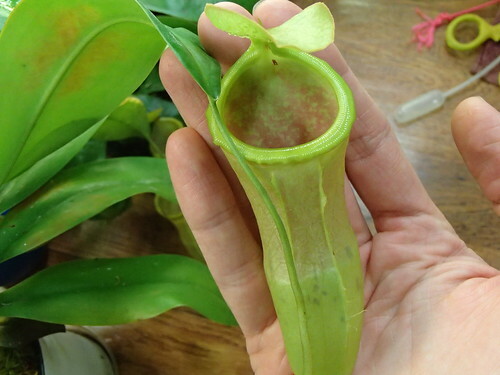 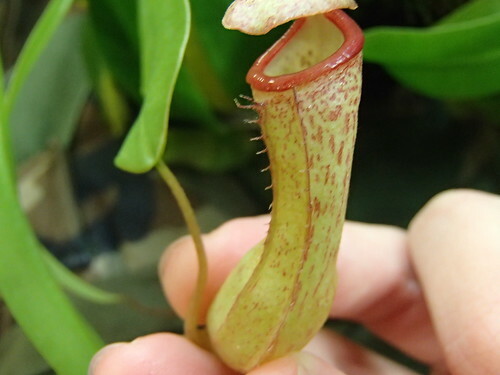 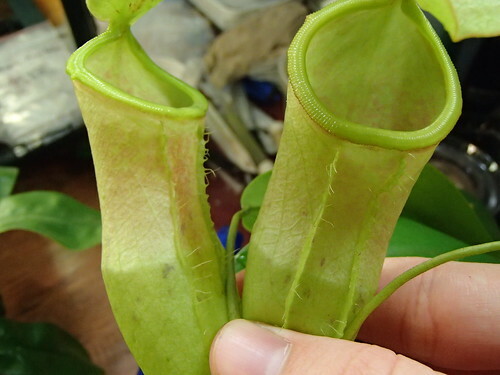 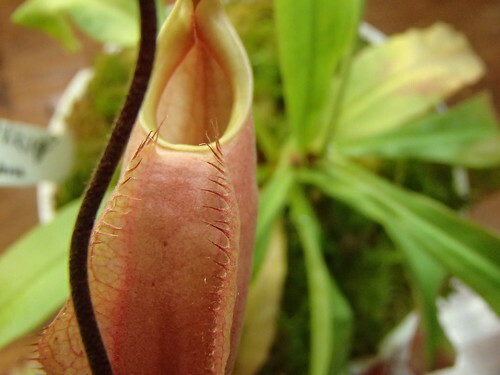 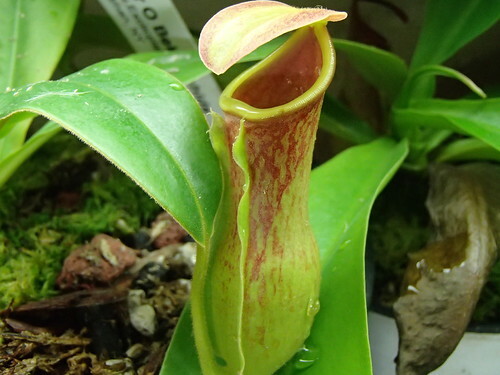 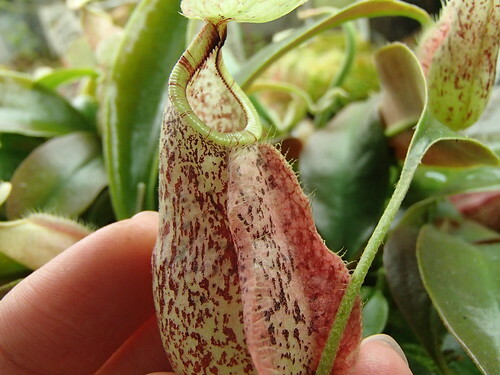 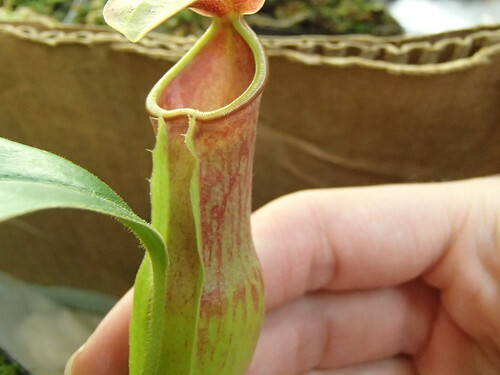 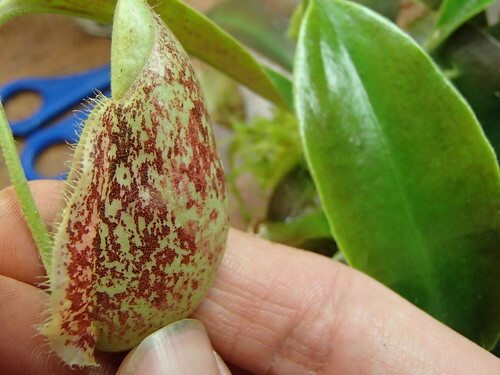 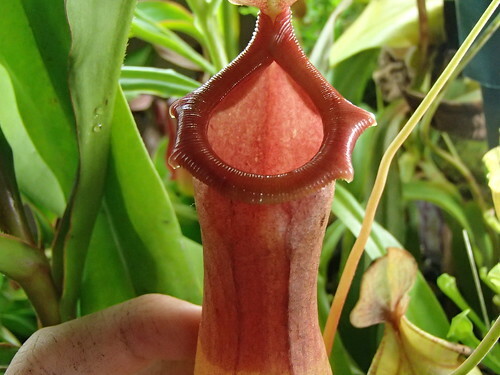 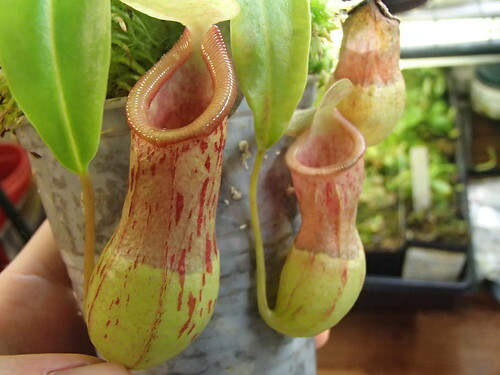 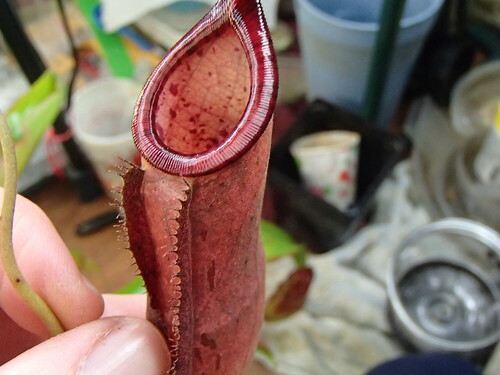 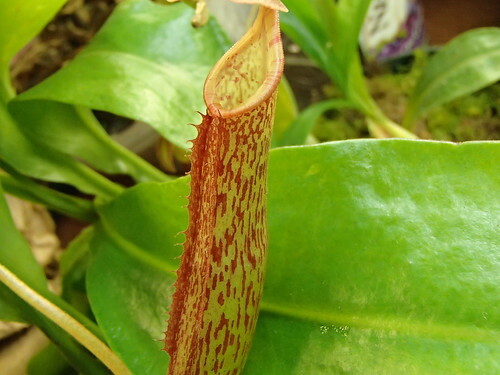 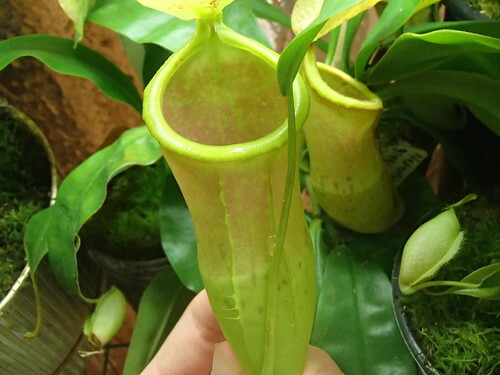 Also, N. rafflesiana pitchers have no hip and all your photos clearly show hips. 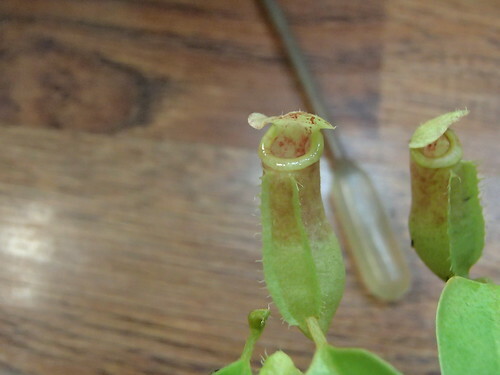 These are the clear differences Clark, et al, mention in the species description. 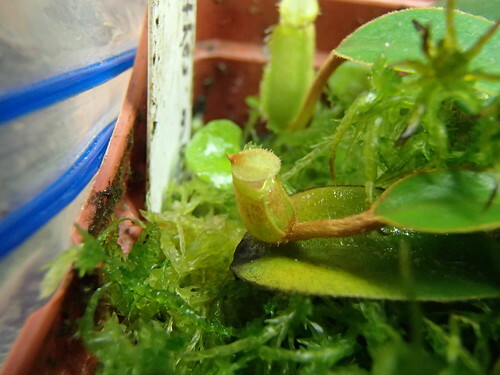 I have no idea how these two species came about. 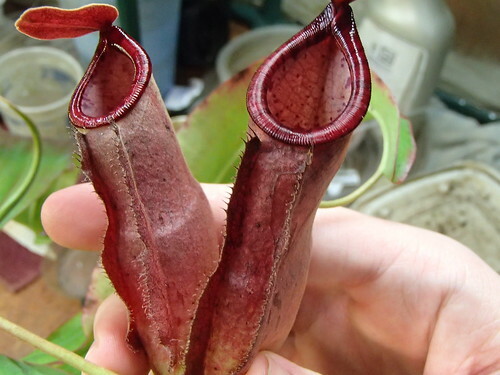 I strongly suspect one or the other is of hybrid origin! 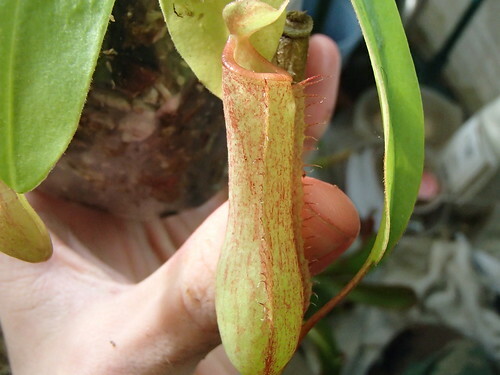 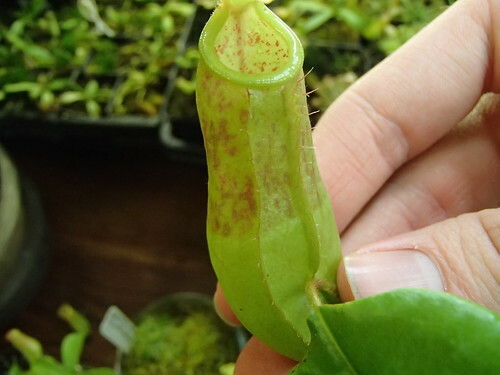 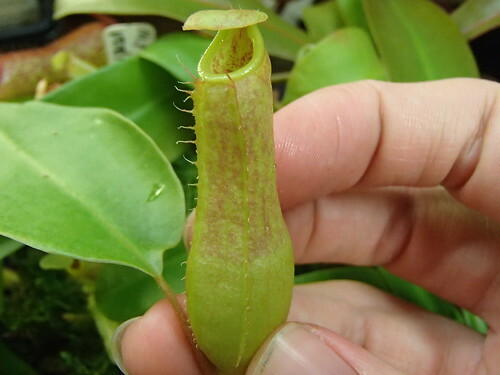 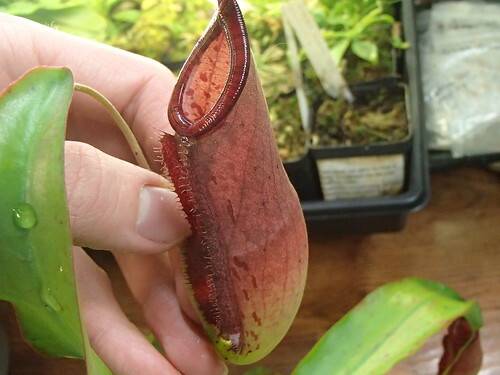 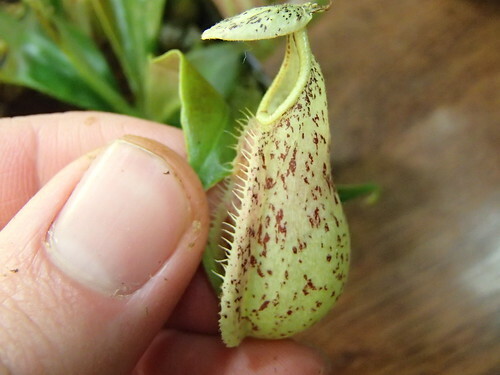 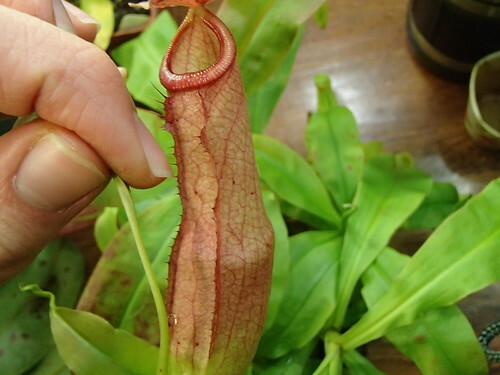 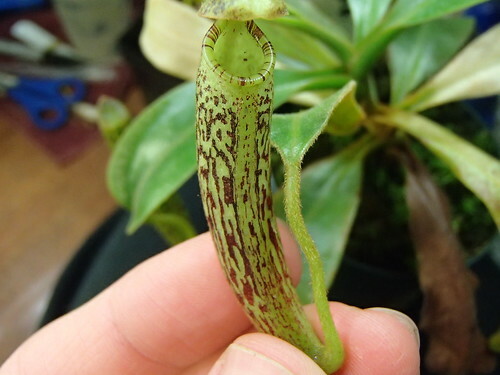 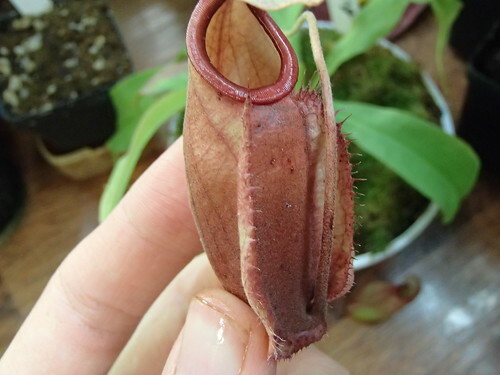 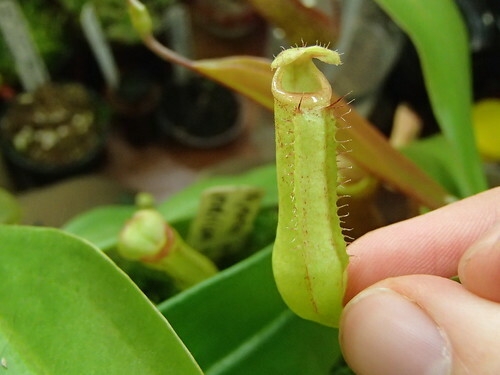 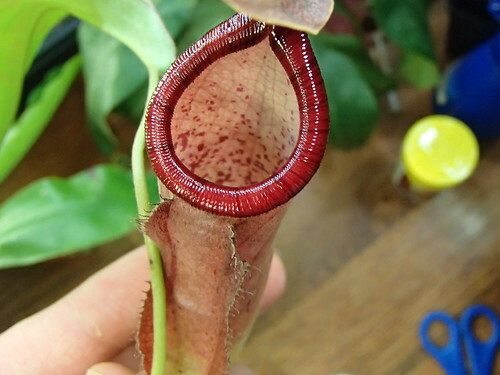 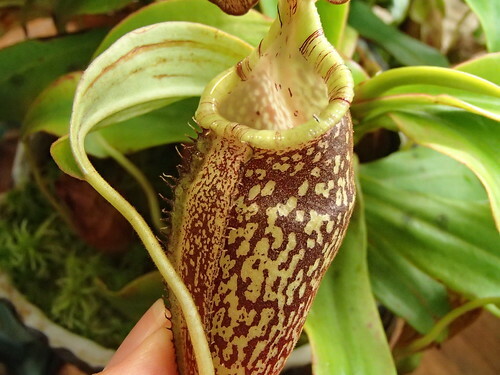 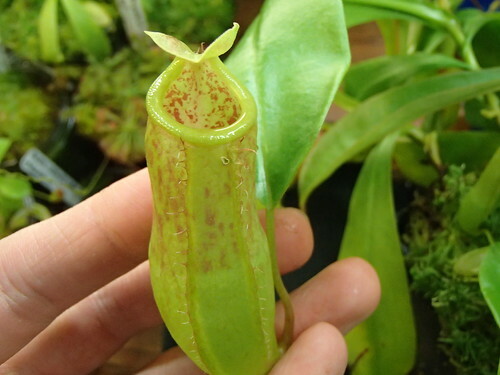 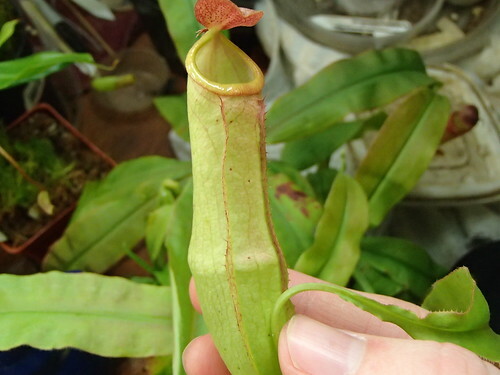 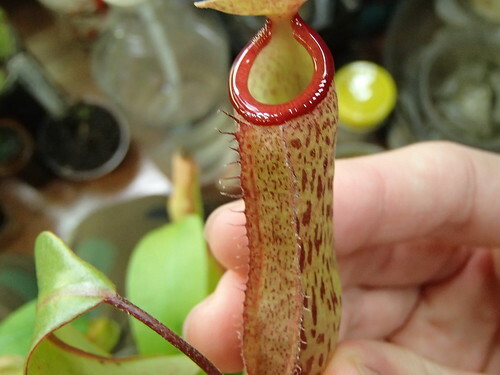 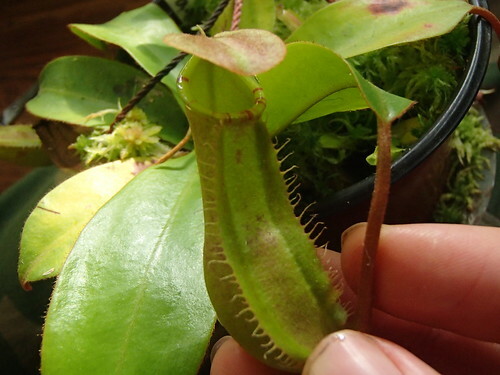 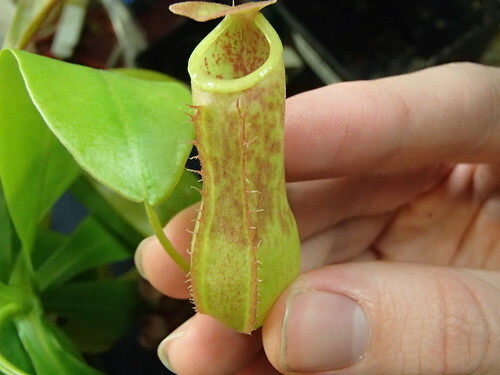 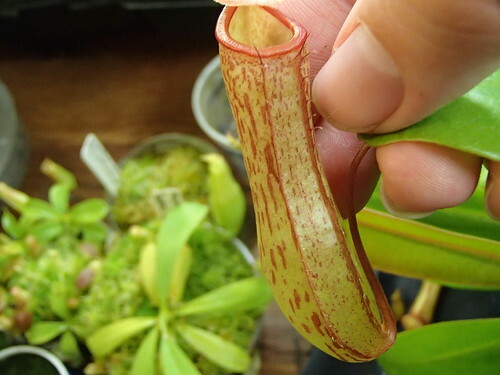 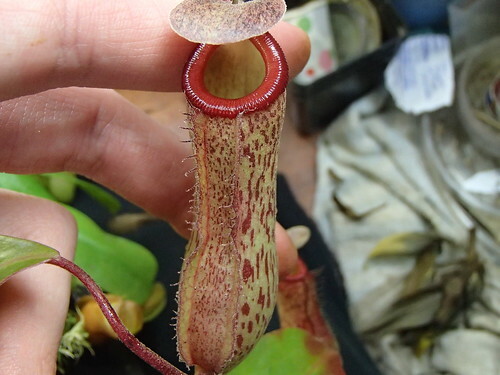 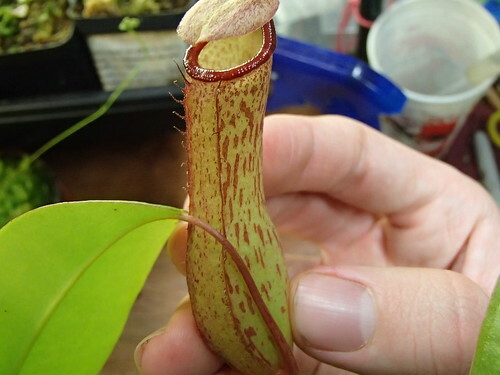 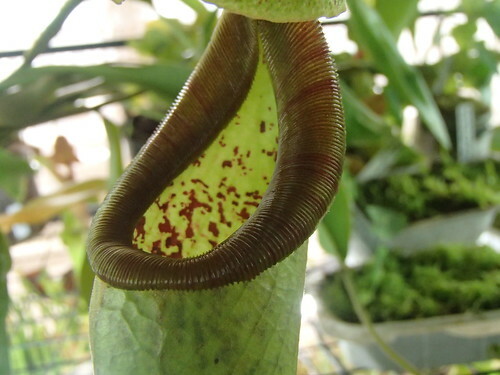 Perhaps N. hemlsyana started off as N. rafflesiana x N. tentaculata and bats took a liking to 'em; giving the hybrid a nutritional boost helping it become a species. 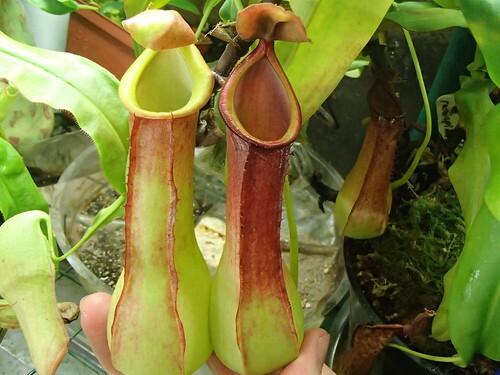 Dave, I will reserve my judgment of what species they may be until my plants start reaching a mature size. 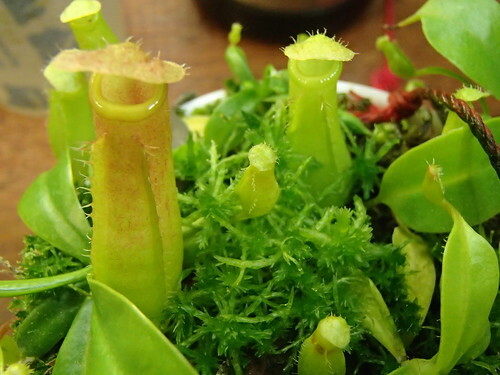 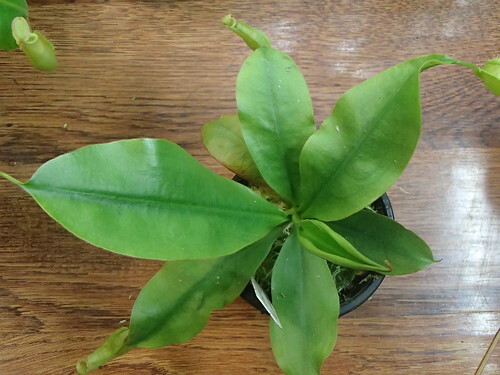 They were grown from seeds labeled as N. rafflesiana and so will be left as such until further notice, and we all know young plants can be somewhat morphologically different from fully mature adults. 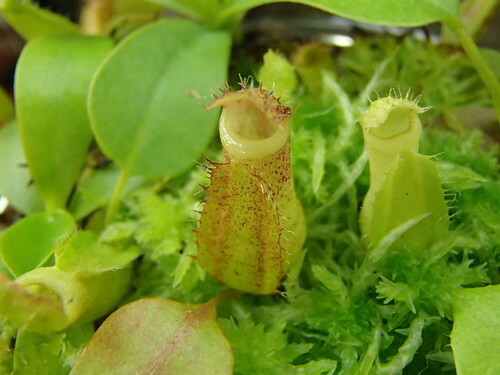 Ontogeny reflects phylogeny, and considering how closely related the two species are I have no doubt seedlings of both species can share the traits you so often point out as belonging to only one species or the other. 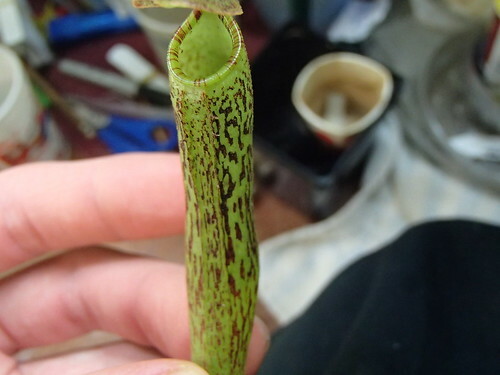 And watching my N. rafflesiana "dark brown" seedlings, the more they age the more difficult it becomes to see any form of hip in a number of them, so if in fact they lose the outward signs of a hip in the coming months what they show now will be a moot point. 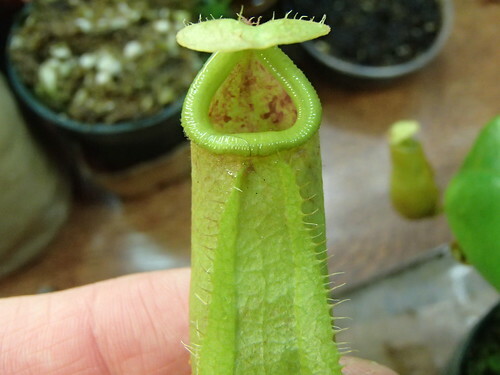 I agree with your logic. 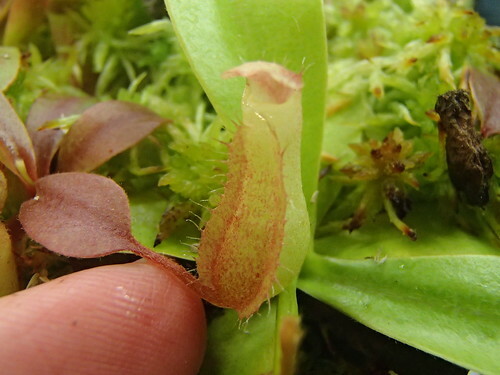 It is just that Clarke, et al., explain it is actually rather easy to tell these two species apart even in the seedling stage and that this was one of the reasons they named it as N. baramensis. 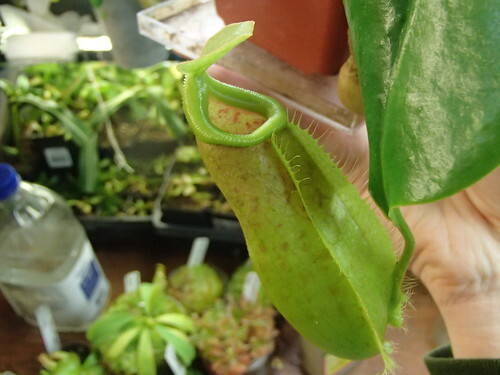 I imported 100's of raff with Dangerous Plants and looking back, most were N. hemslyana and hybrids with N. h.. 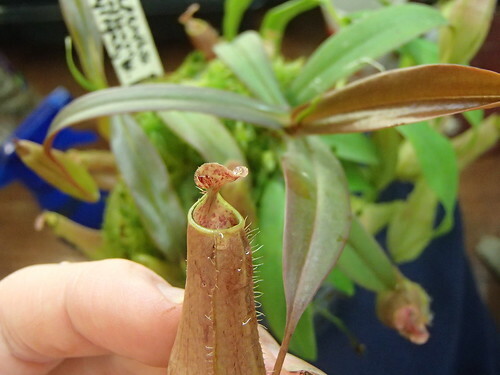 I think the hybrids have effectively blurred our ability to recognize the parent species. 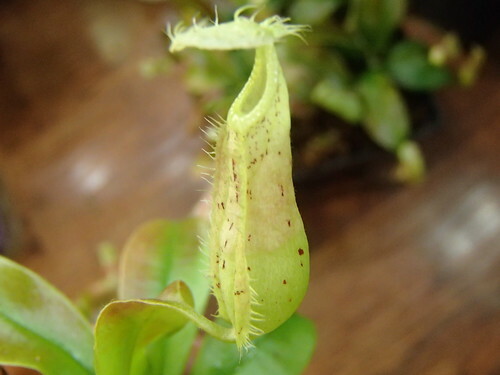 And nearly all hybrids that occur with N. rafflesiana on Borneo are probably going to happen with N. hemslyana as well, like N. hemslyana x N. ampullaria and it is going to be extremely difficult to tell from N. x hookeriana. 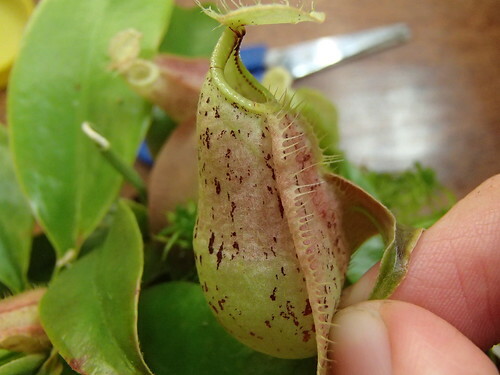 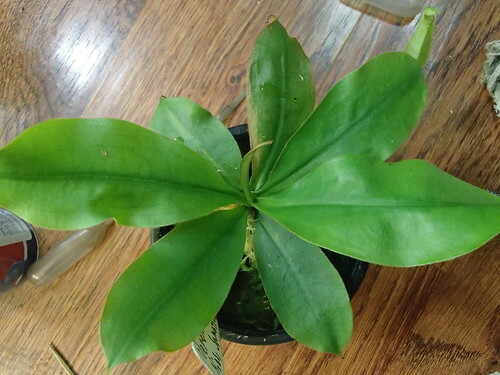 And since N. x hookeriana isn't attached to a type specimen, that name might actually apply to N. ampullaria x N. hemslyana.